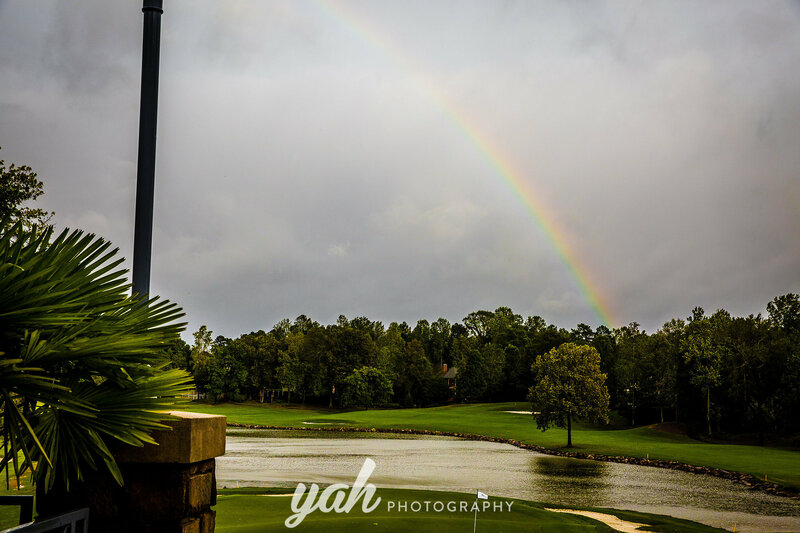 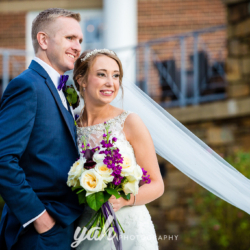 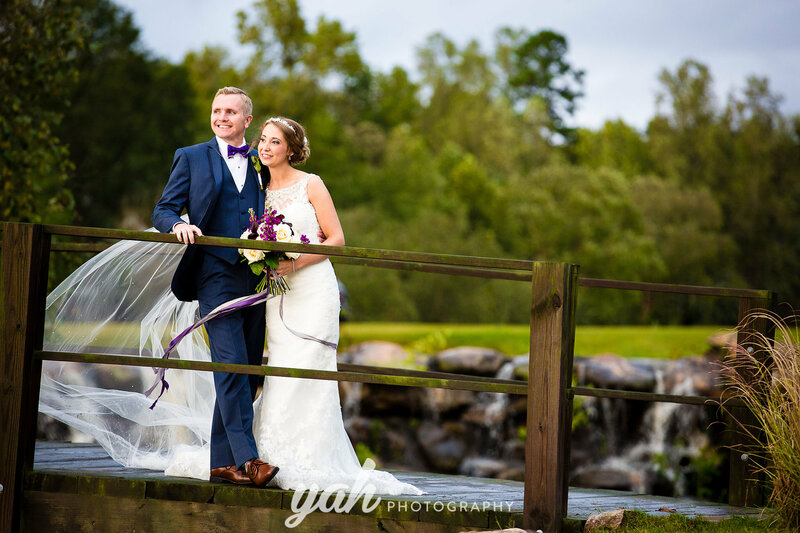 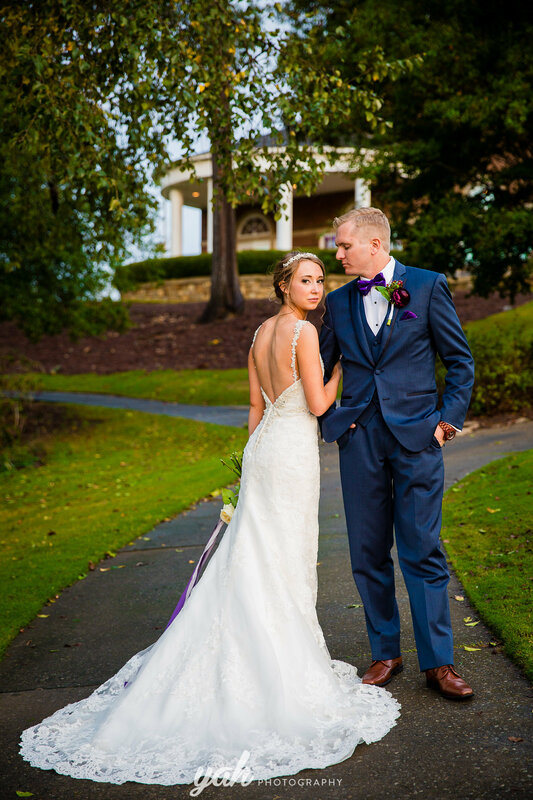 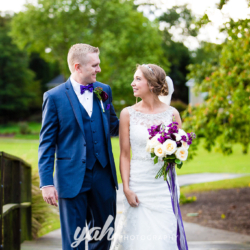 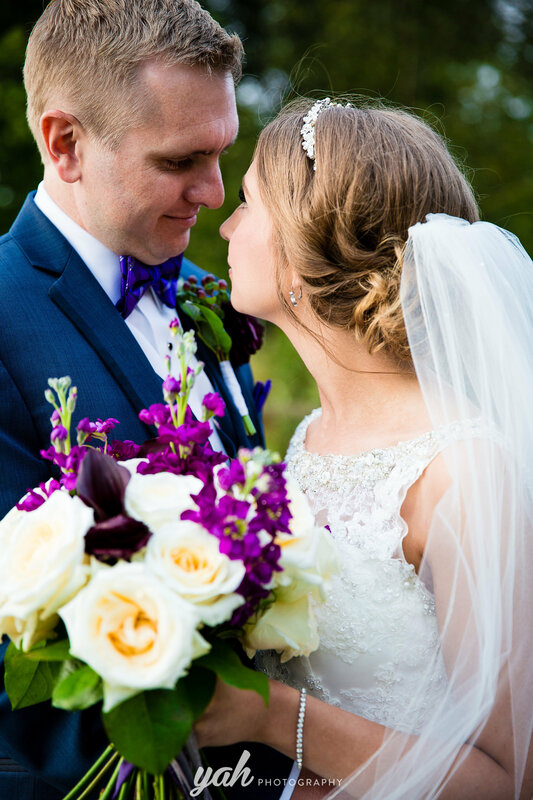 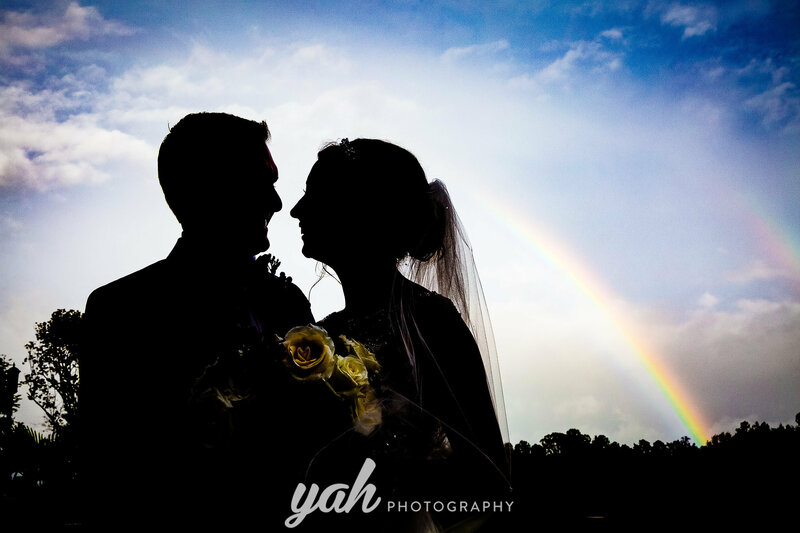 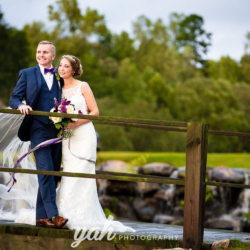 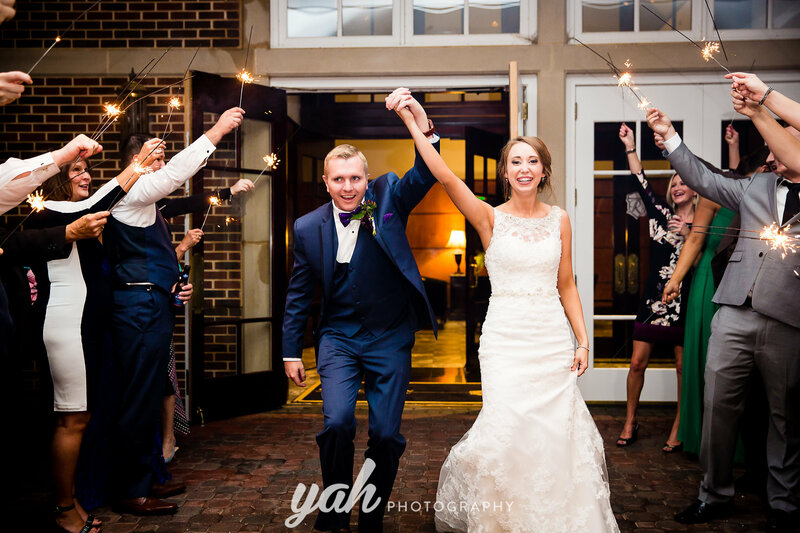 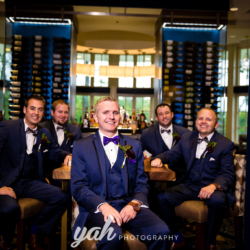 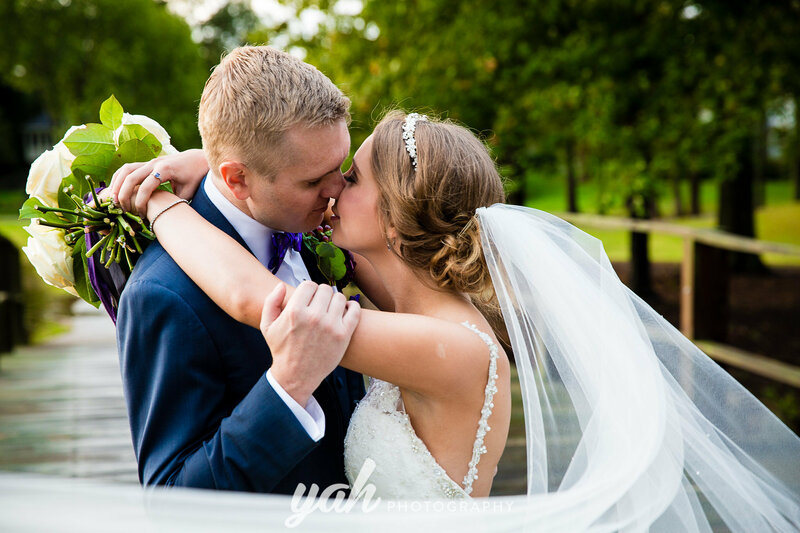 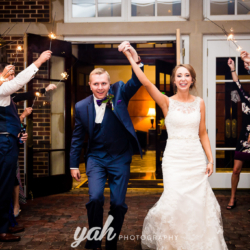 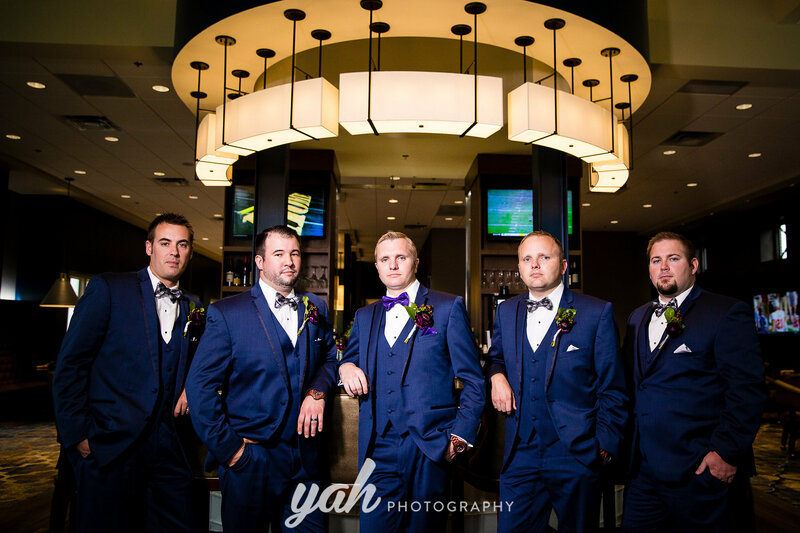 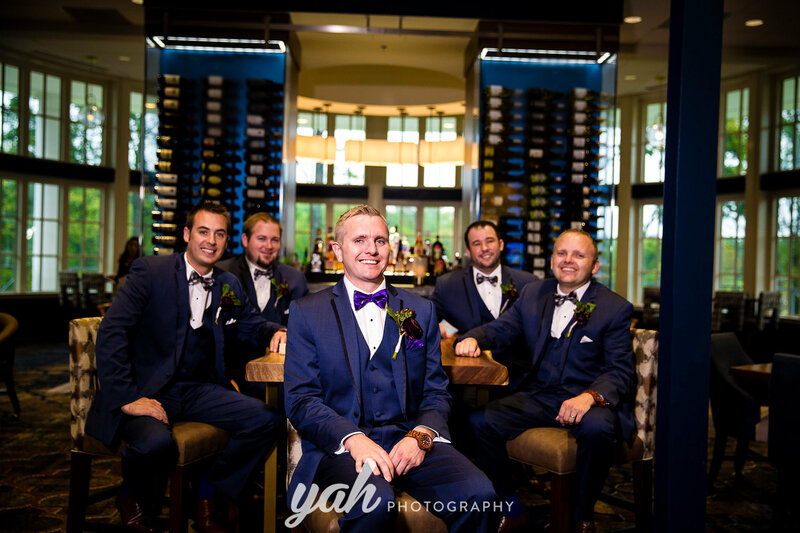 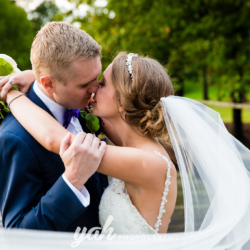 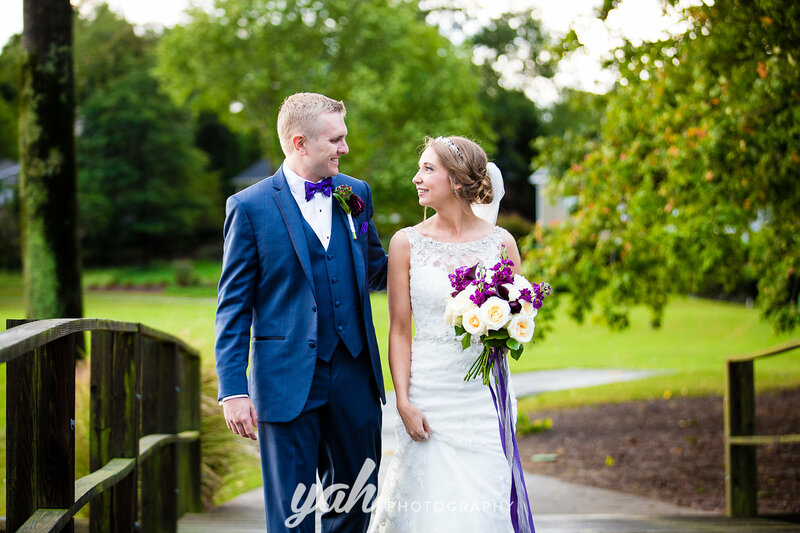 Bri and Ryan’s wedding day was met with a hurricane, but that did not stop this lovely couple from having an amazing time! 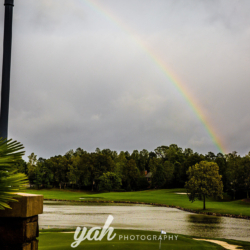 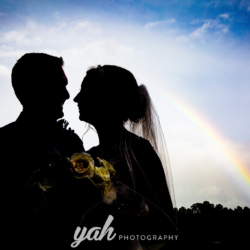 And as a result of the hurricane, they had the most beautiful rainbow during their photo time. 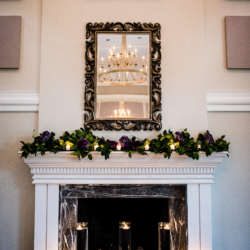 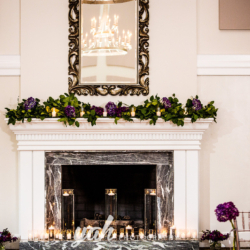 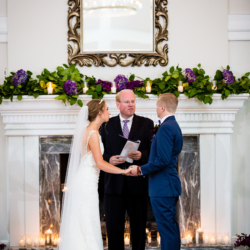 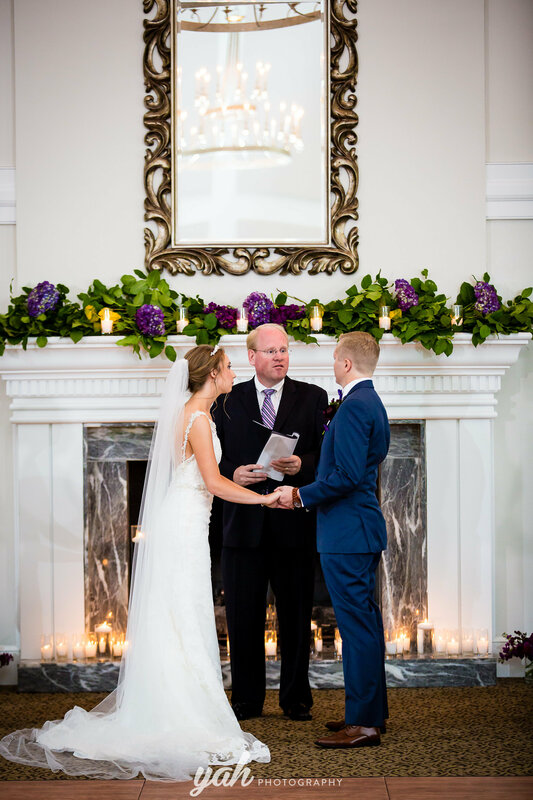 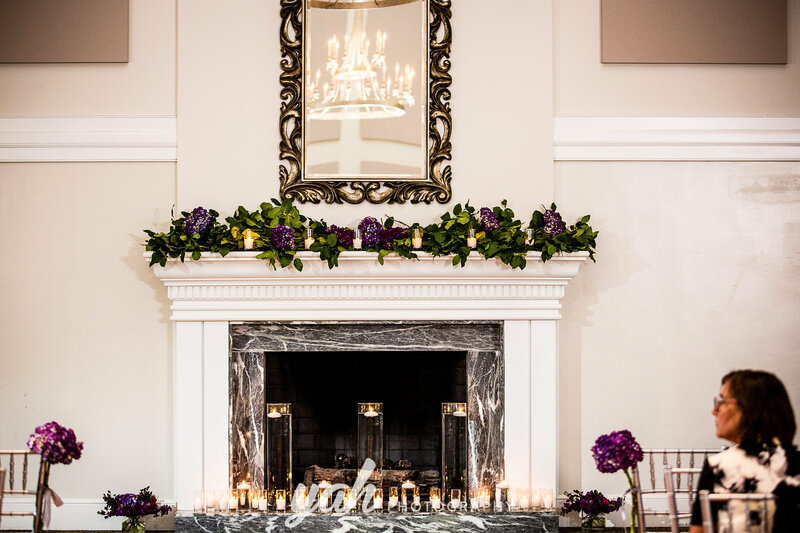 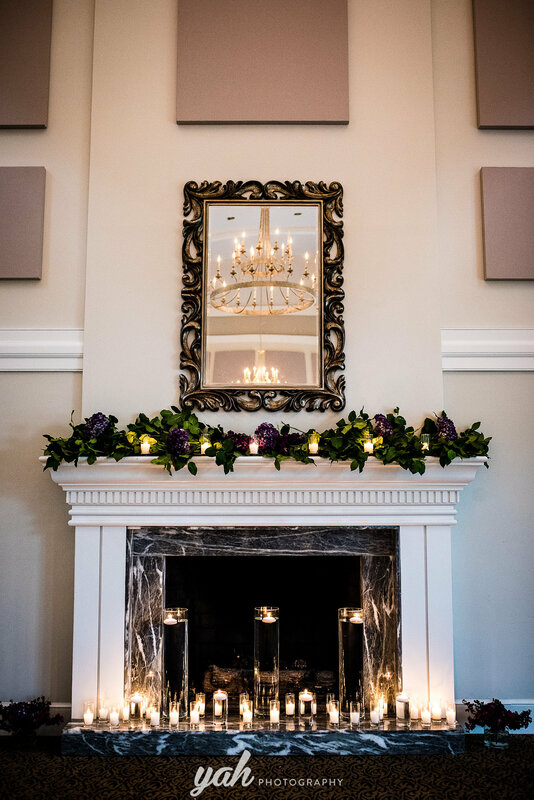 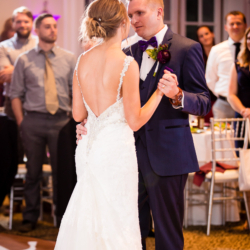 I turned the mantle into a beautiful backdrop for her day before we flipped the ballroom. 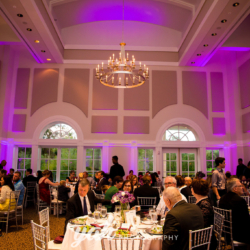 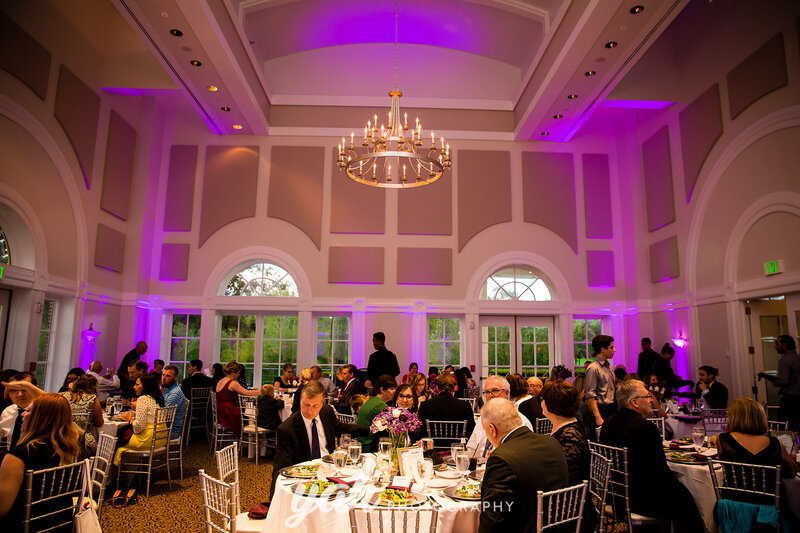 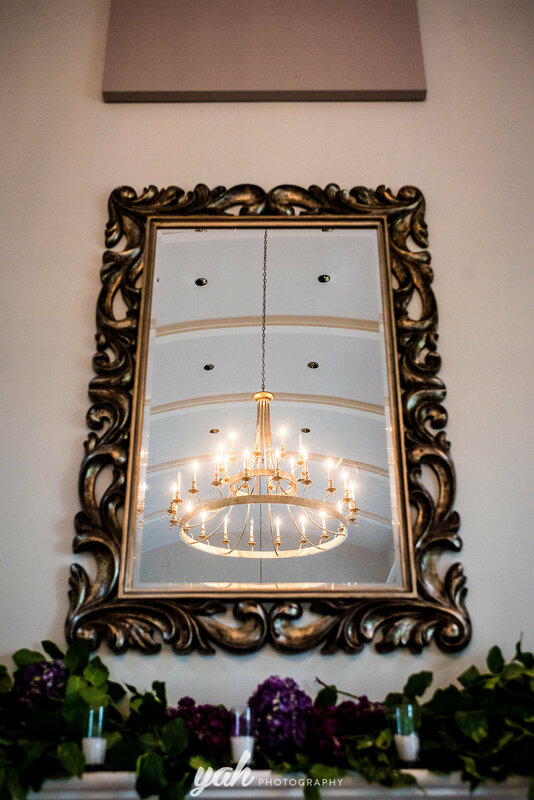 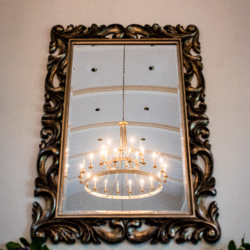 And the chandelier in the ballroom added to the beautiful backdrop. 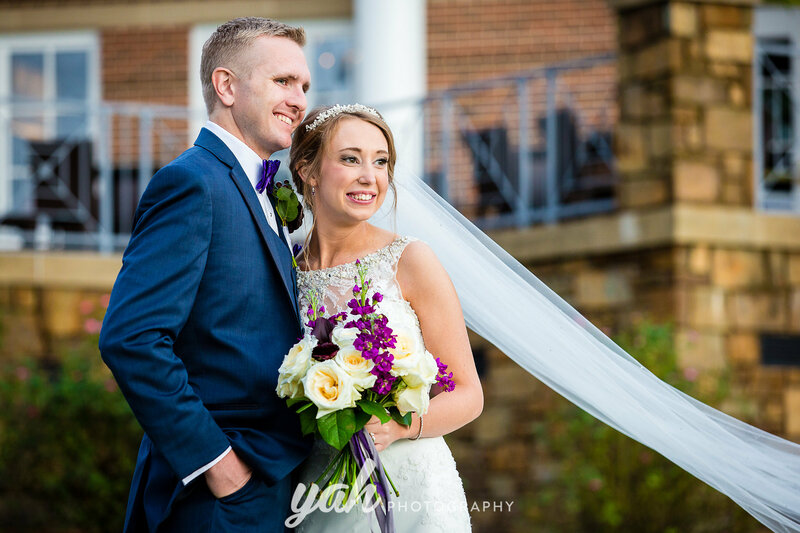 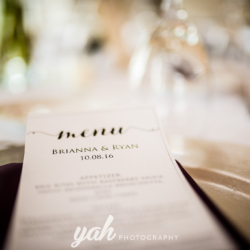 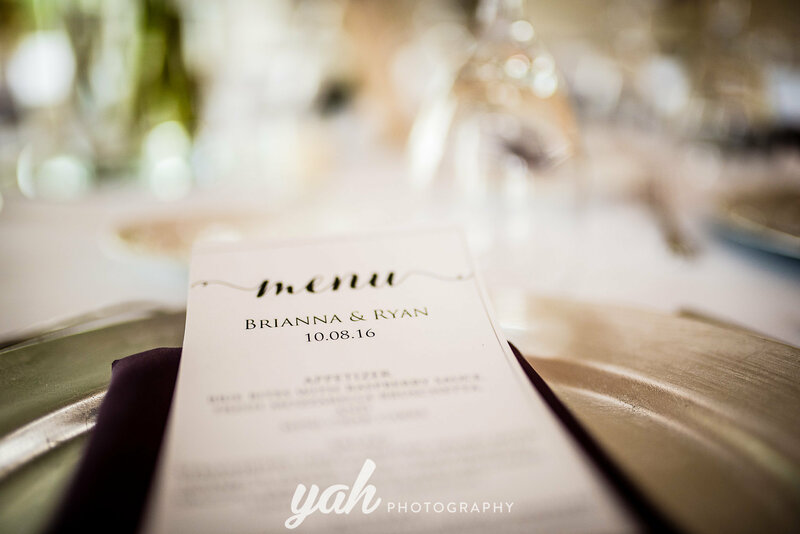 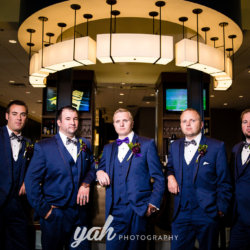 Bri contacted me in the winter and we worked on their wedding day through Panera lunch dates – the best kind! 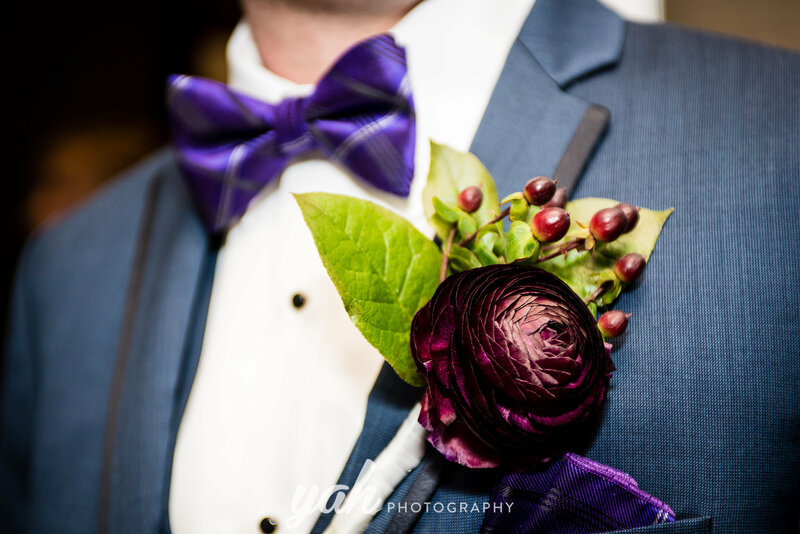 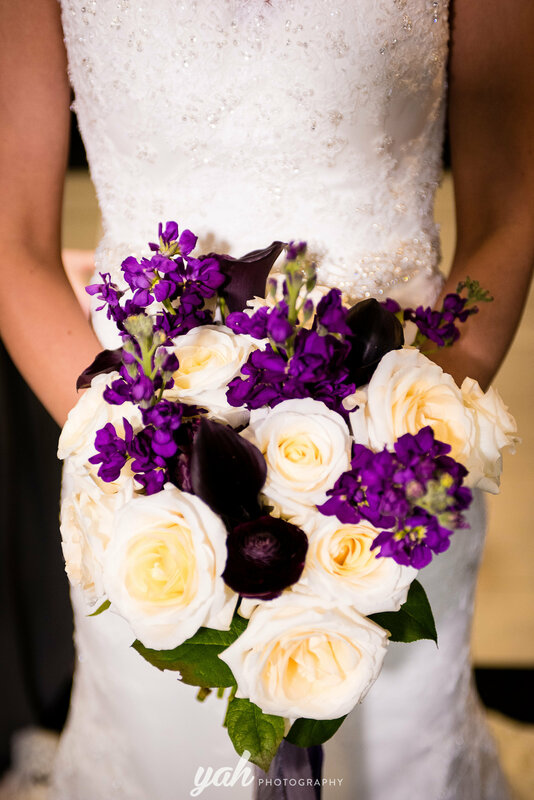 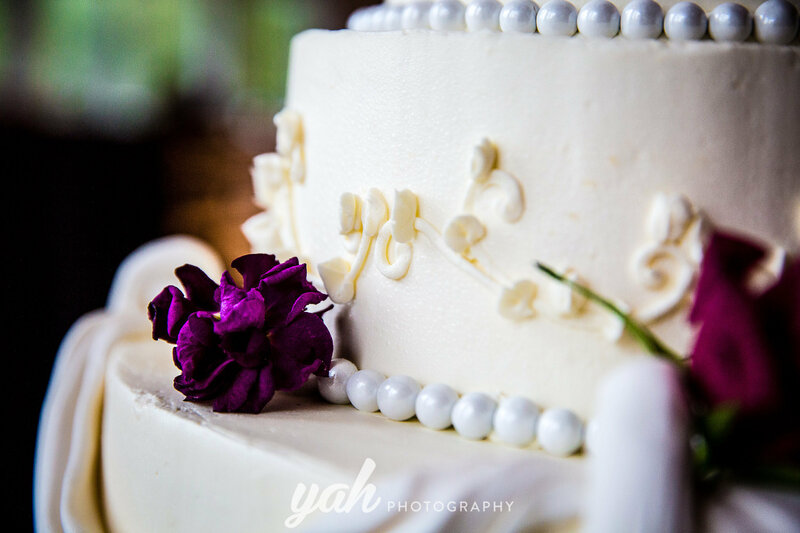 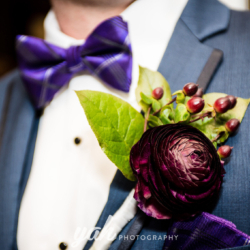 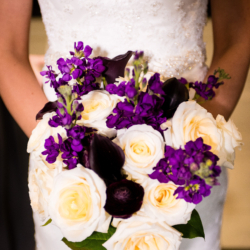 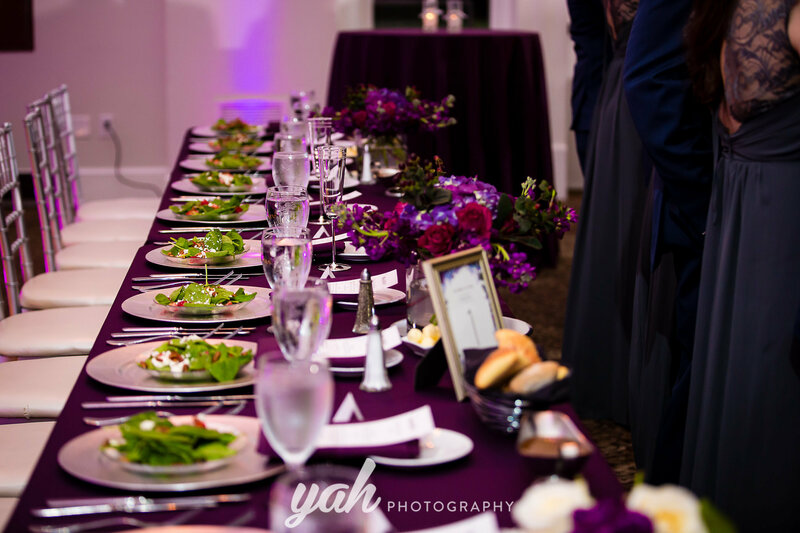 Bri wanted to use her favorite color purple throughout and wanted some green touches, but not too much like mardi gras. 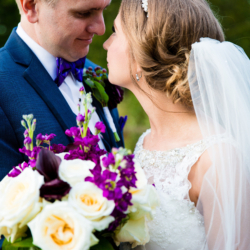 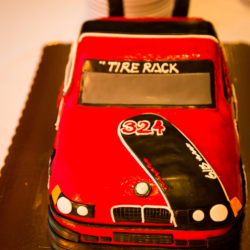 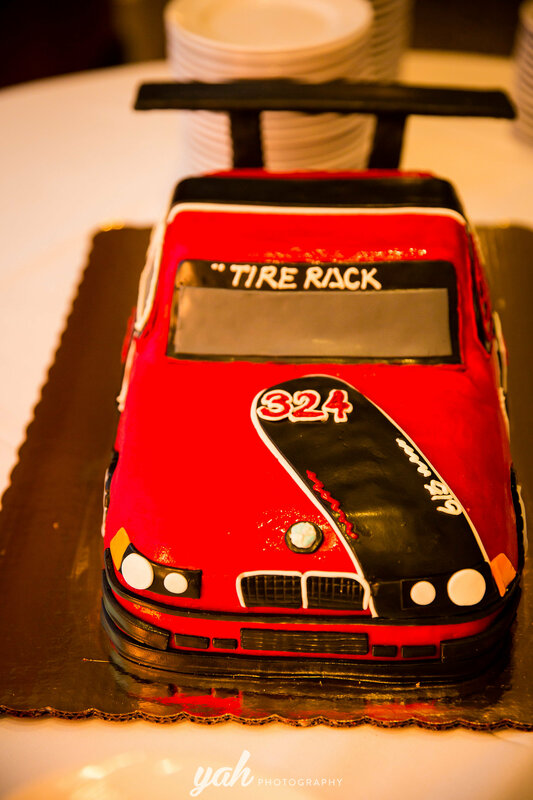 Her color choices could not have been any better! 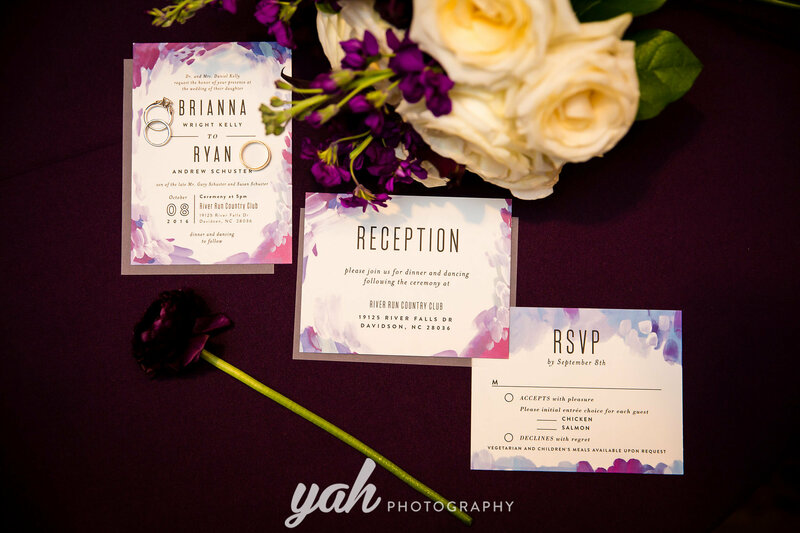 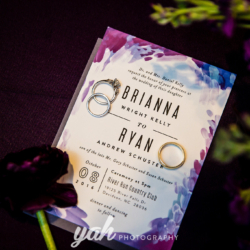 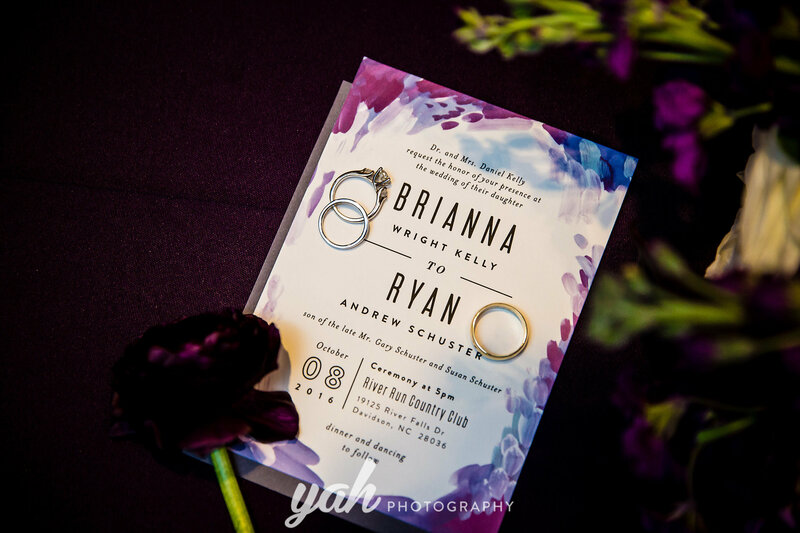 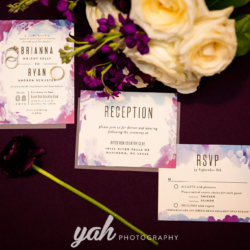 The invitations and paper from Minted went perfectly with the flowers I helped her to select. 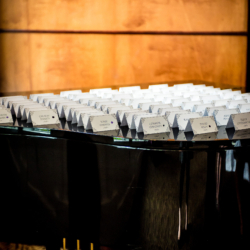 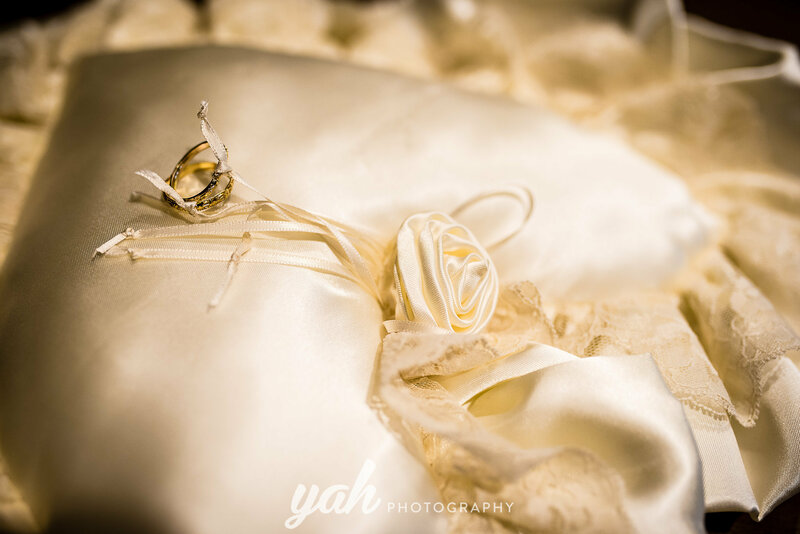 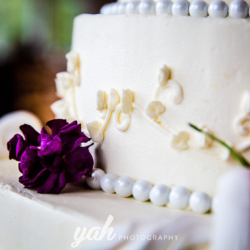 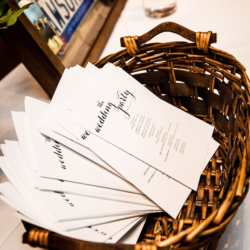 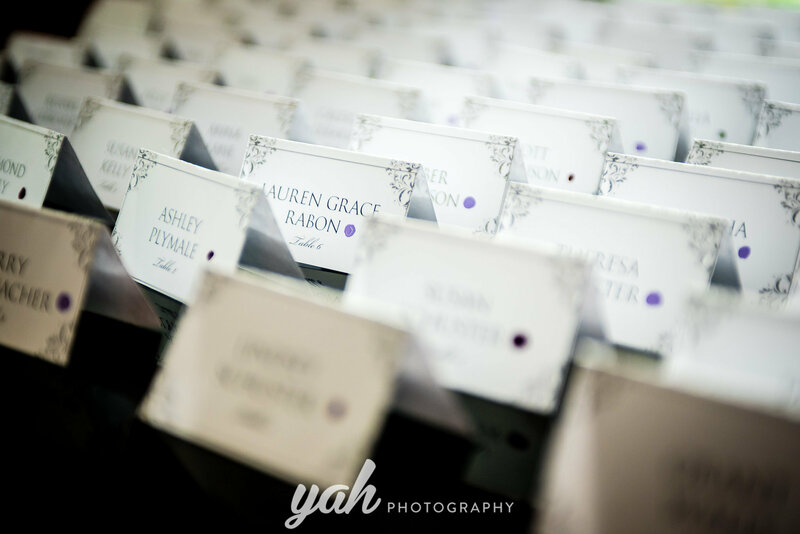 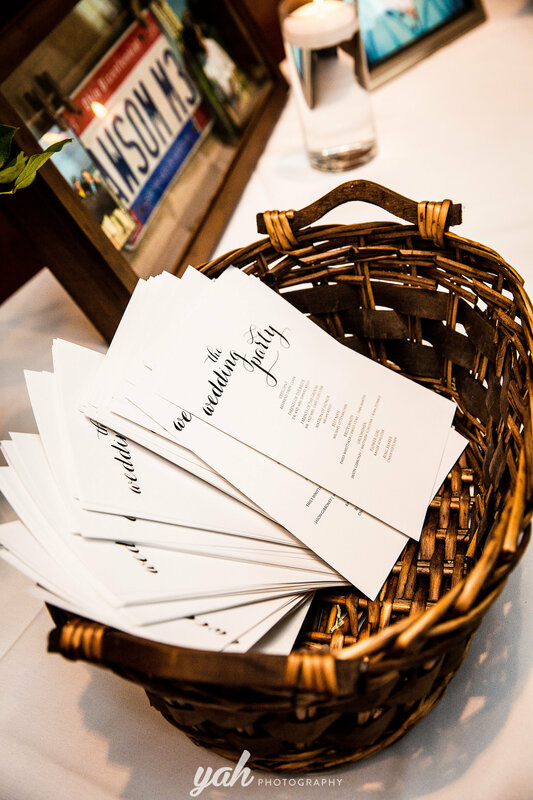 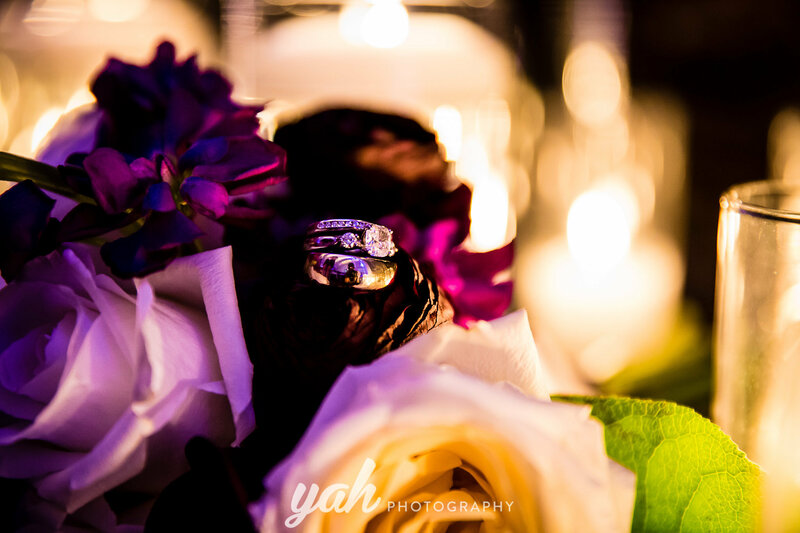 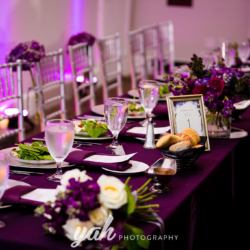 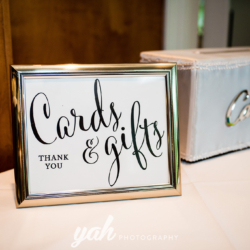 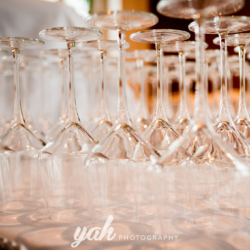 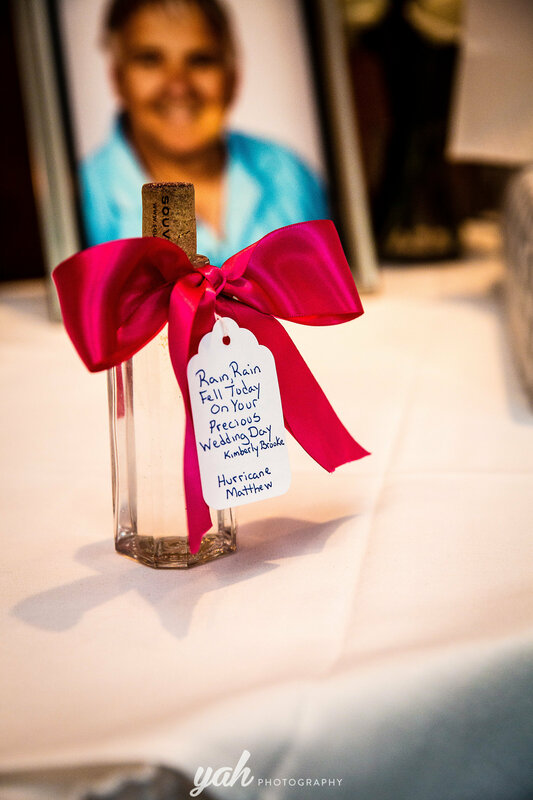 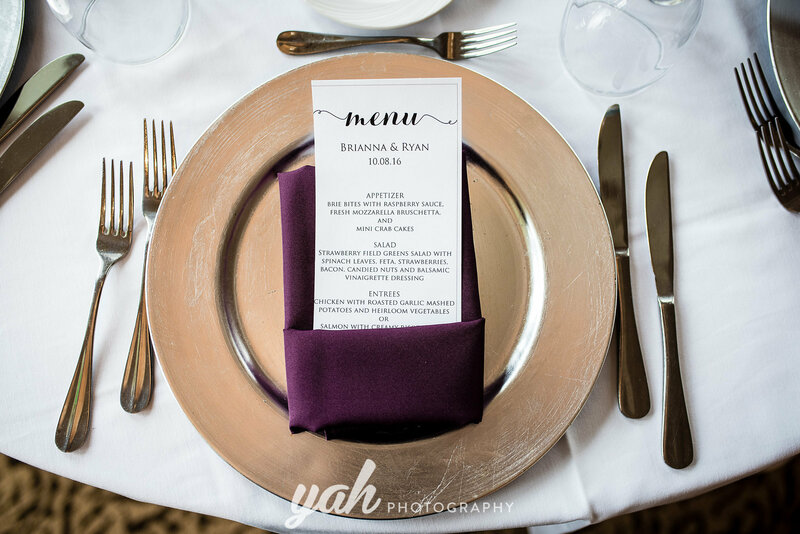 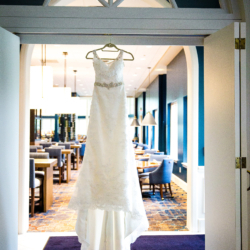 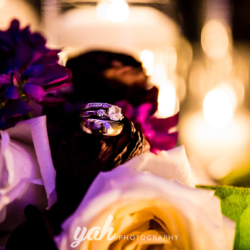 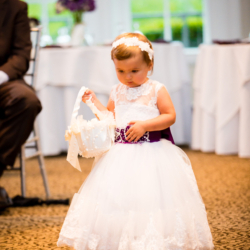 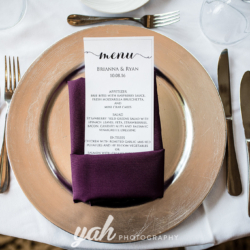 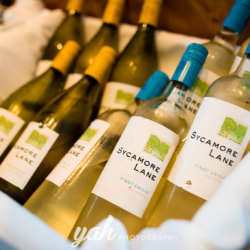 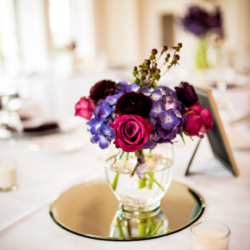 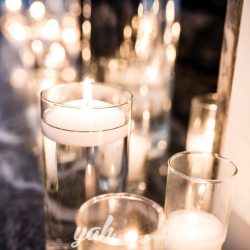 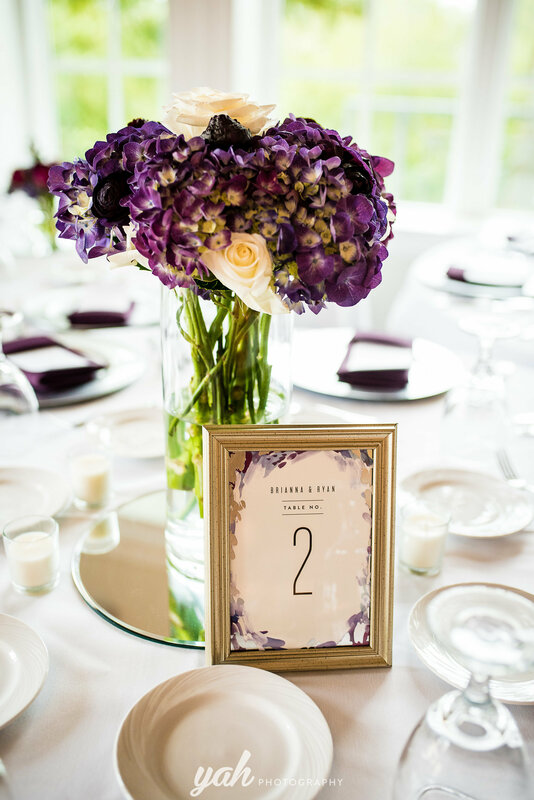 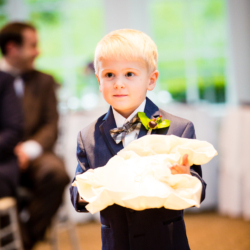 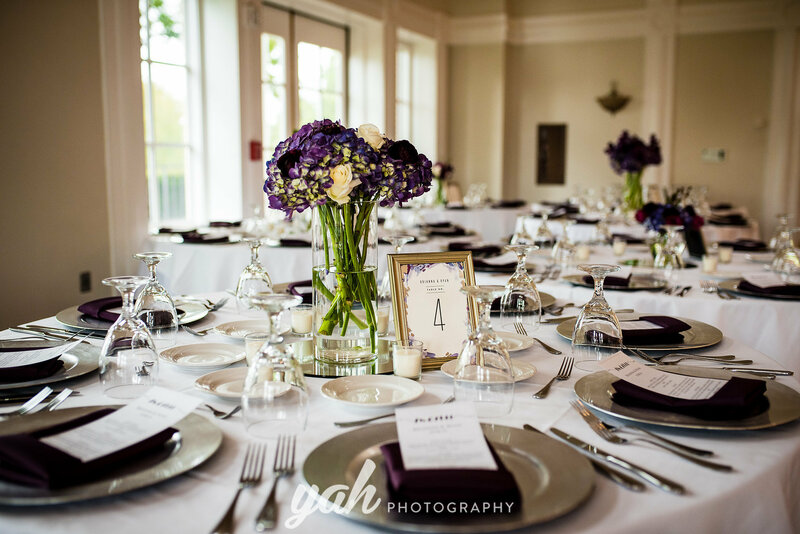 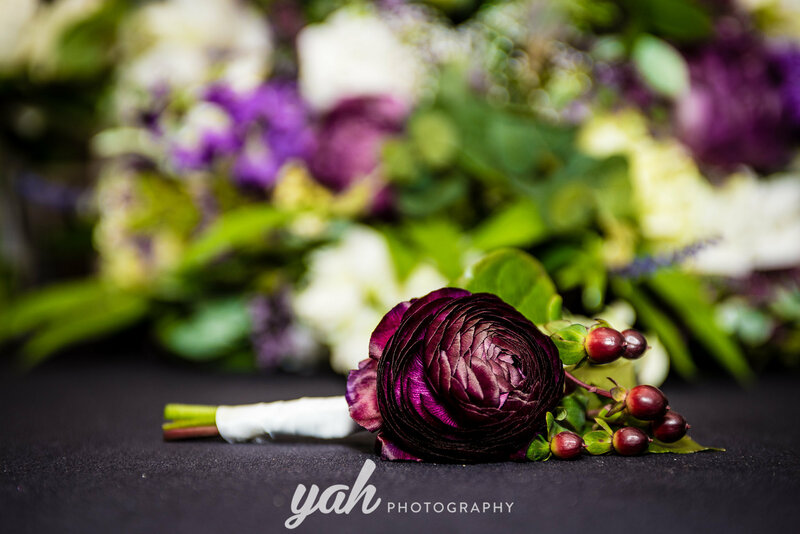 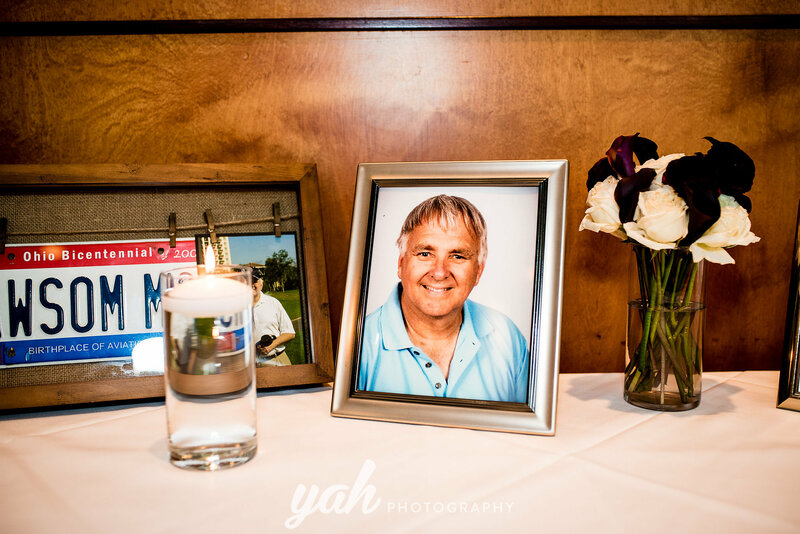 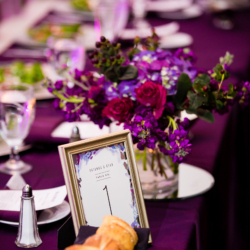 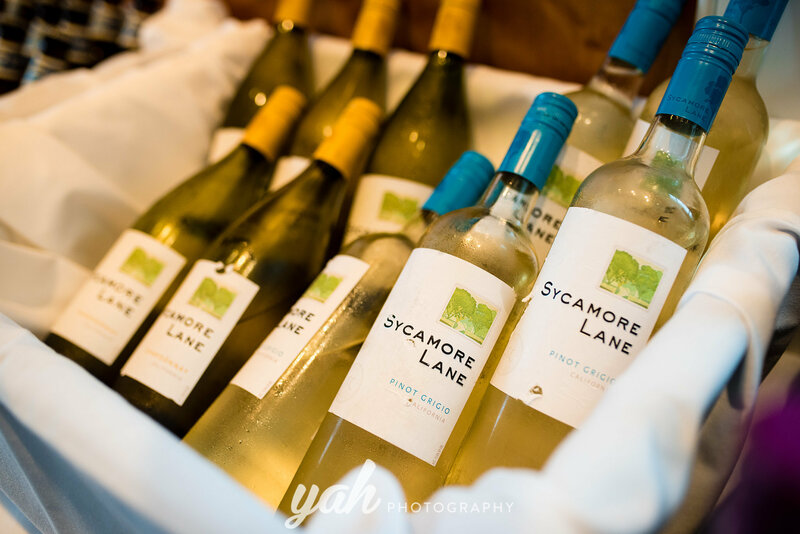 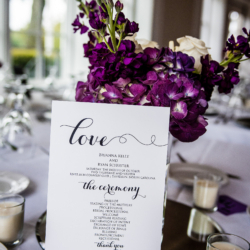 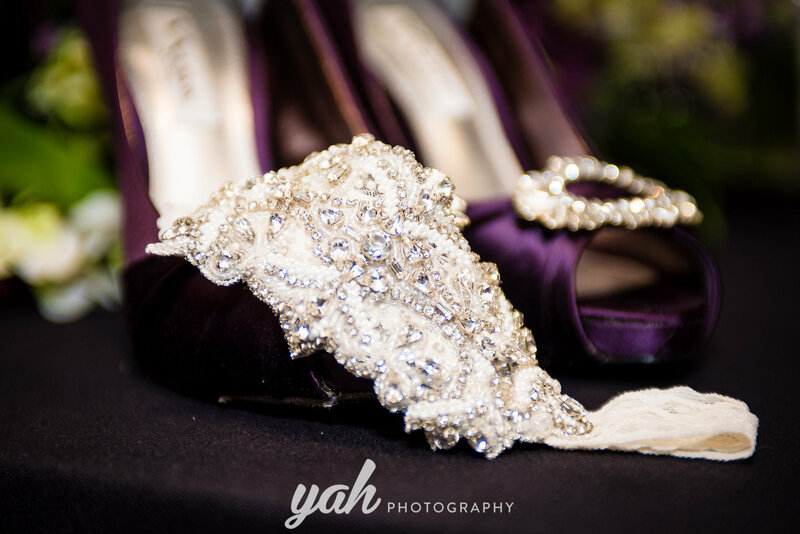 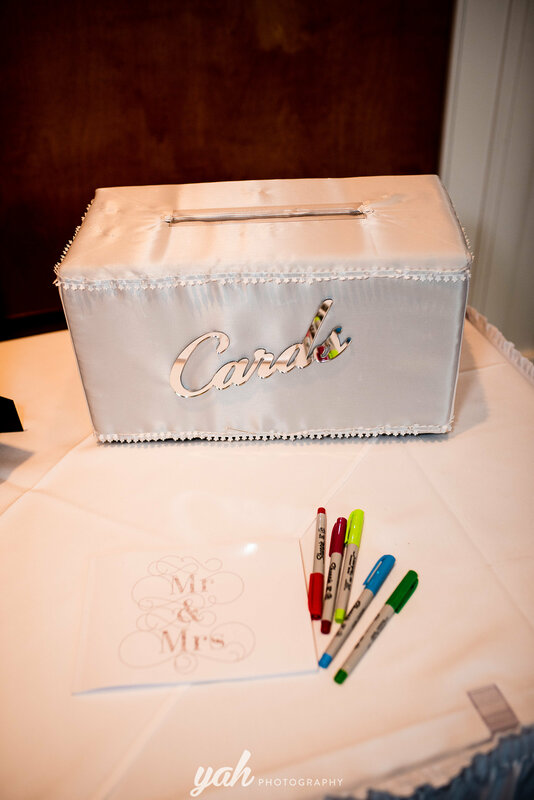 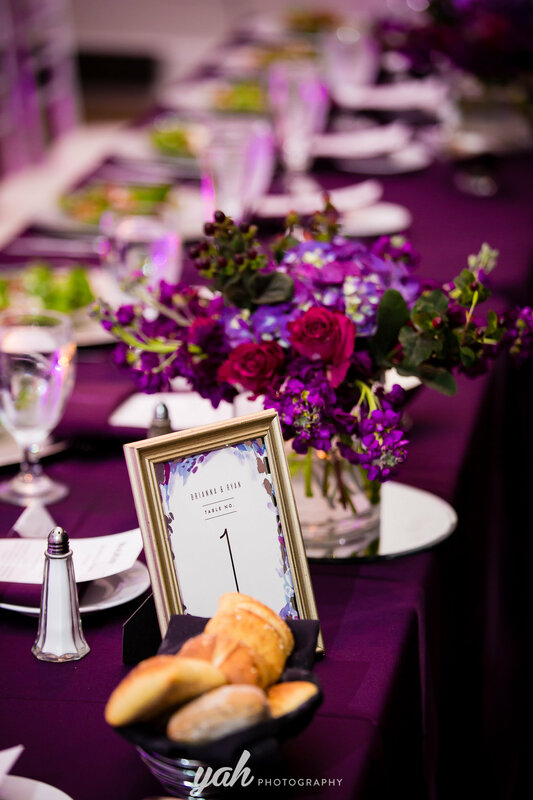 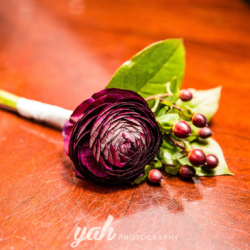 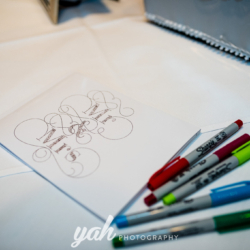 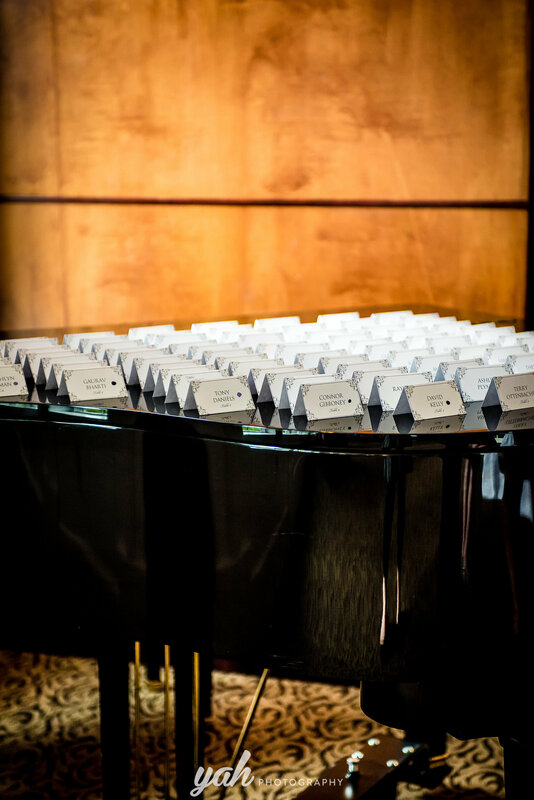 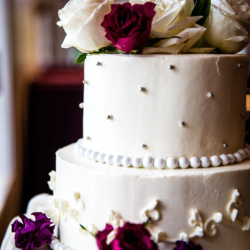 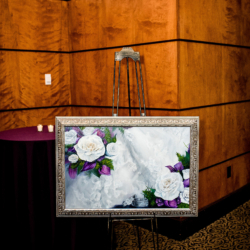 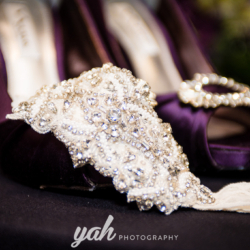 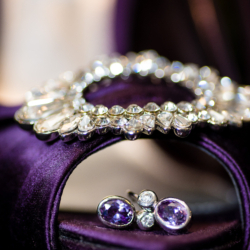 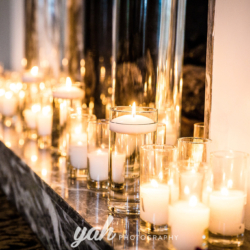 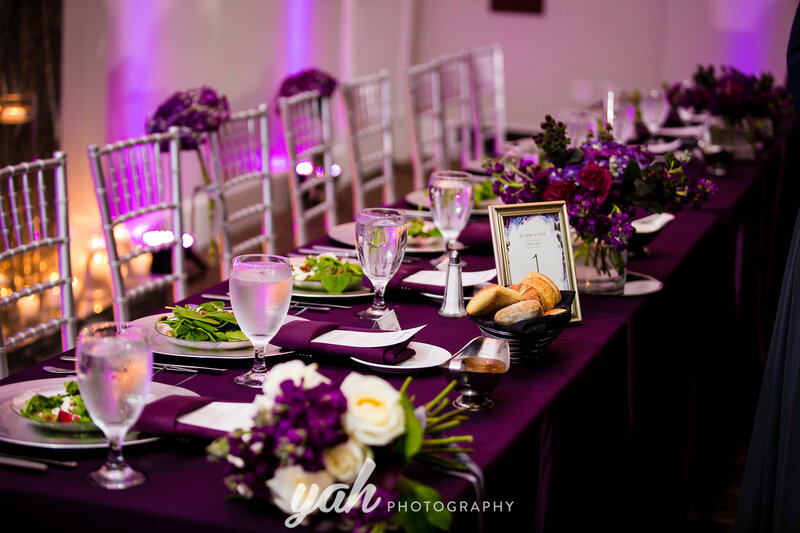 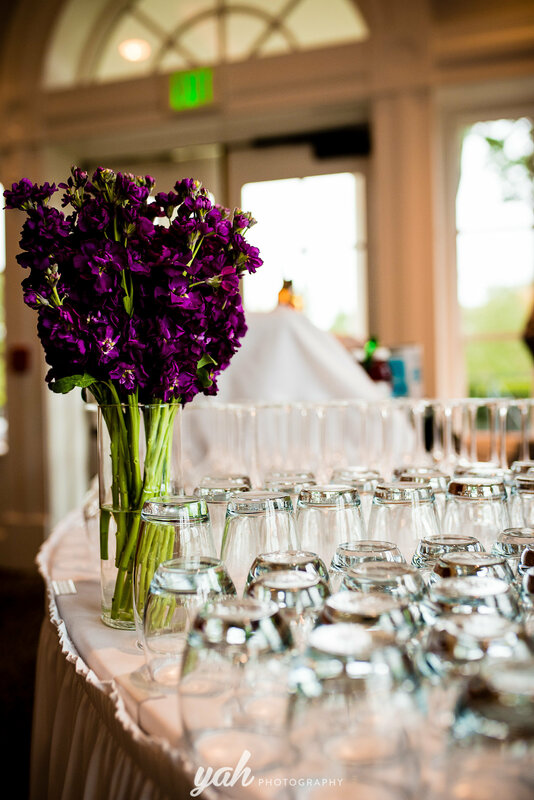 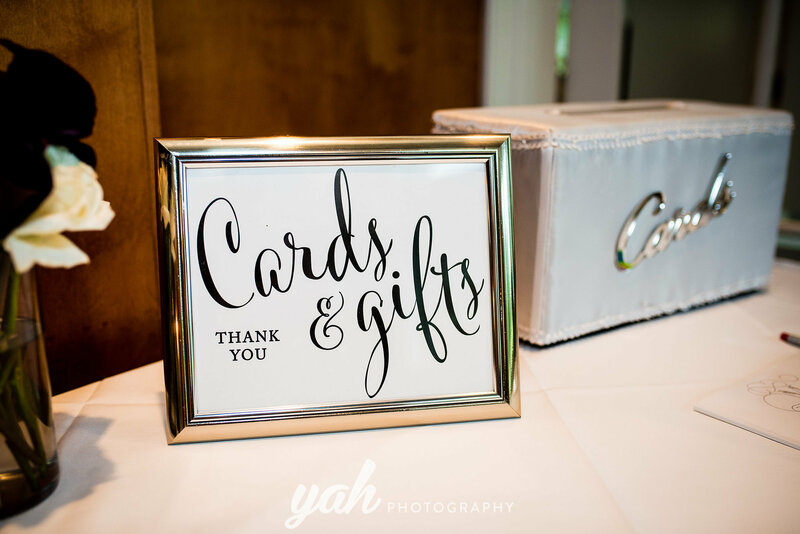 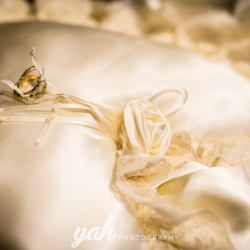 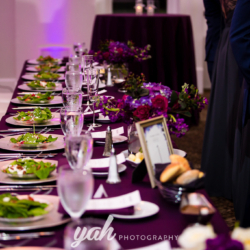 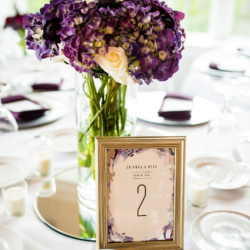 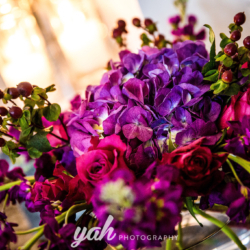 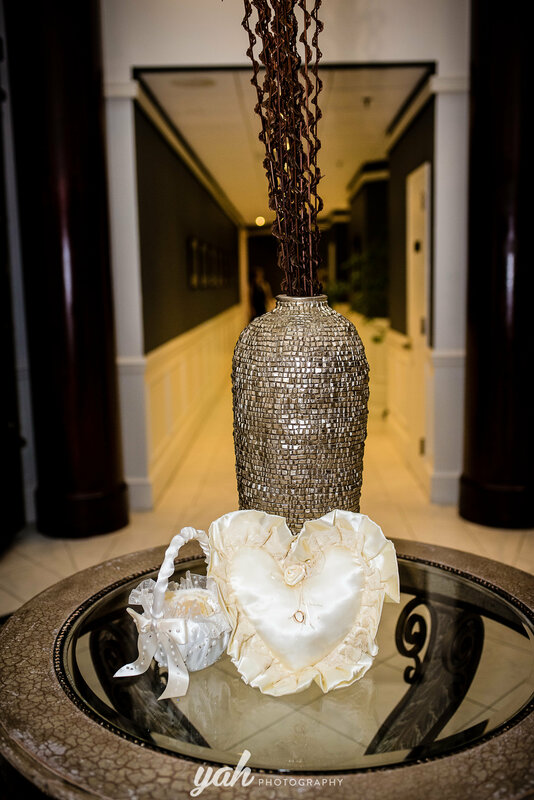 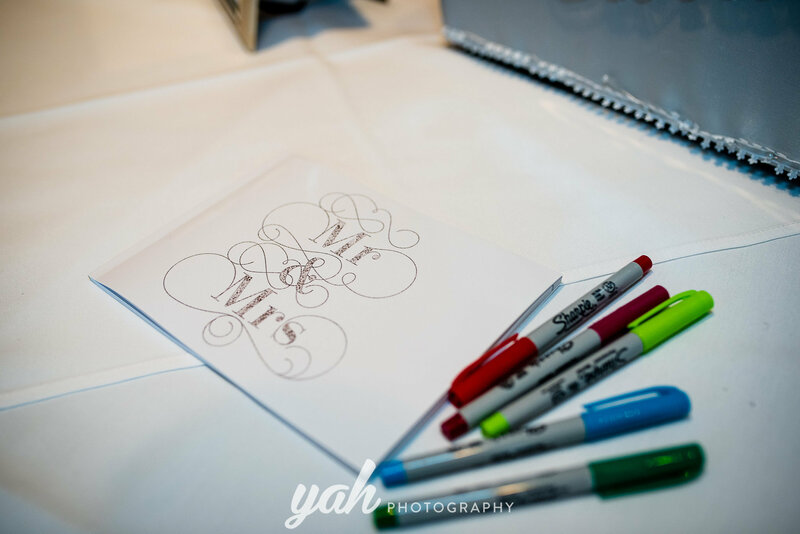 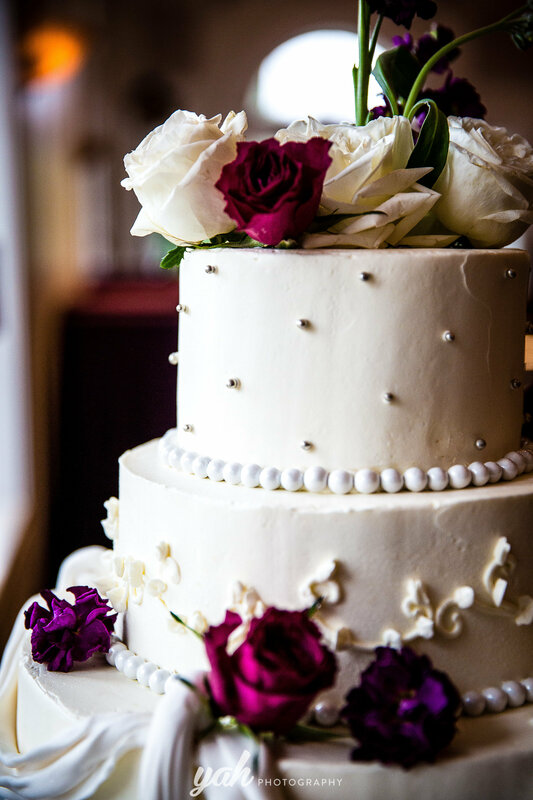 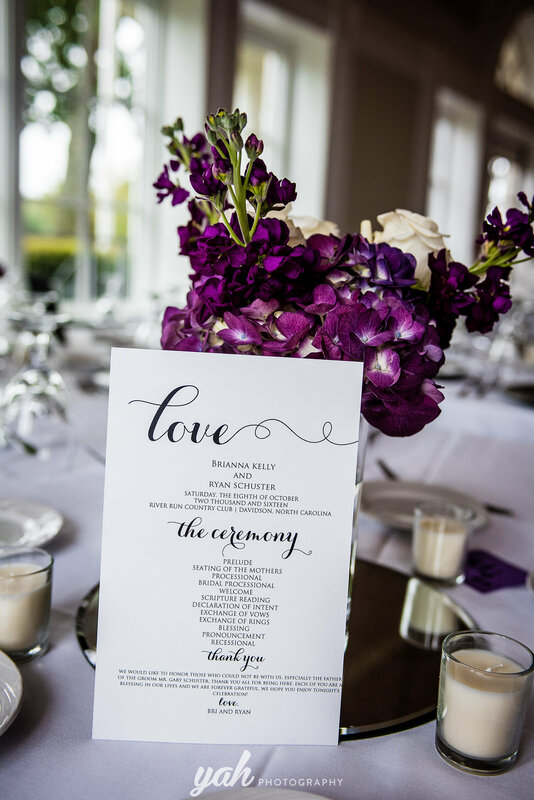 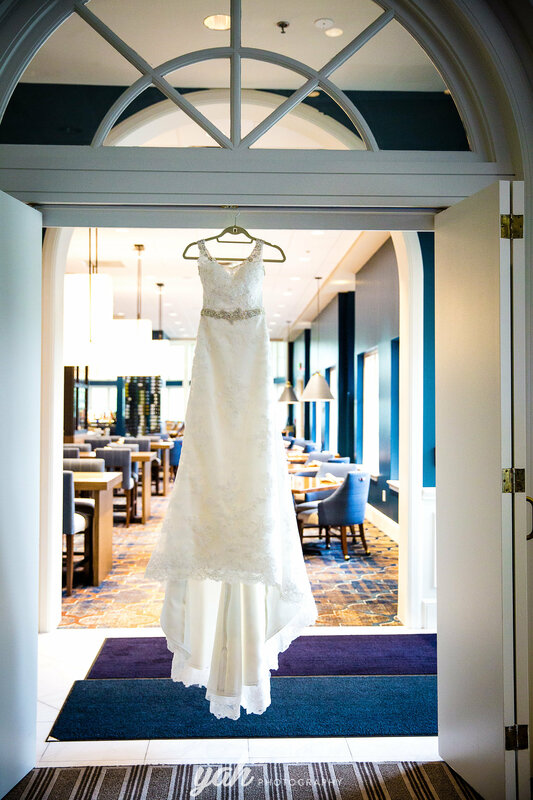 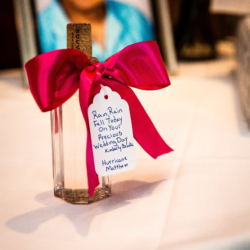 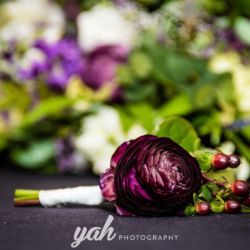 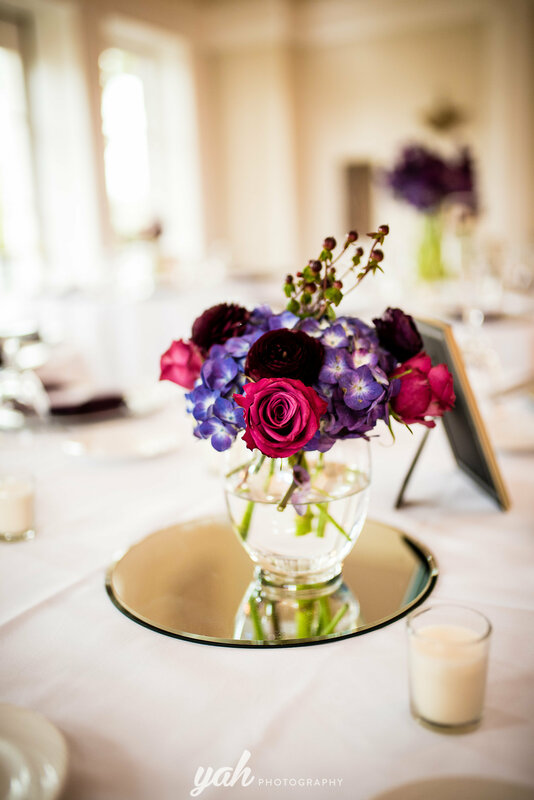 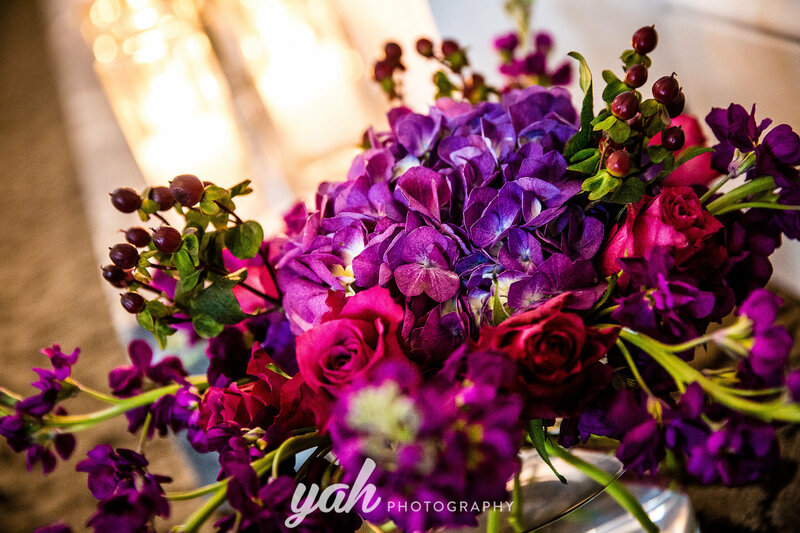 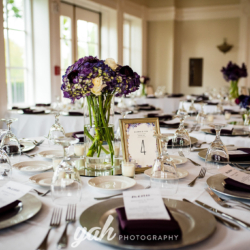 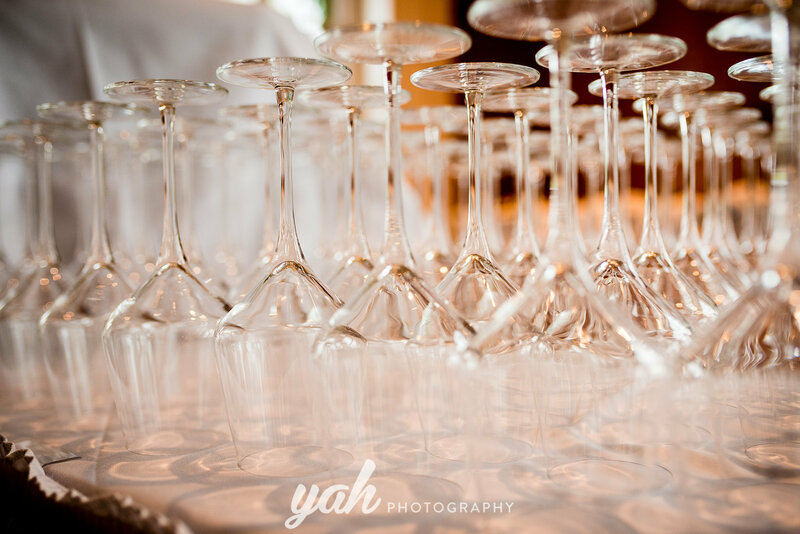 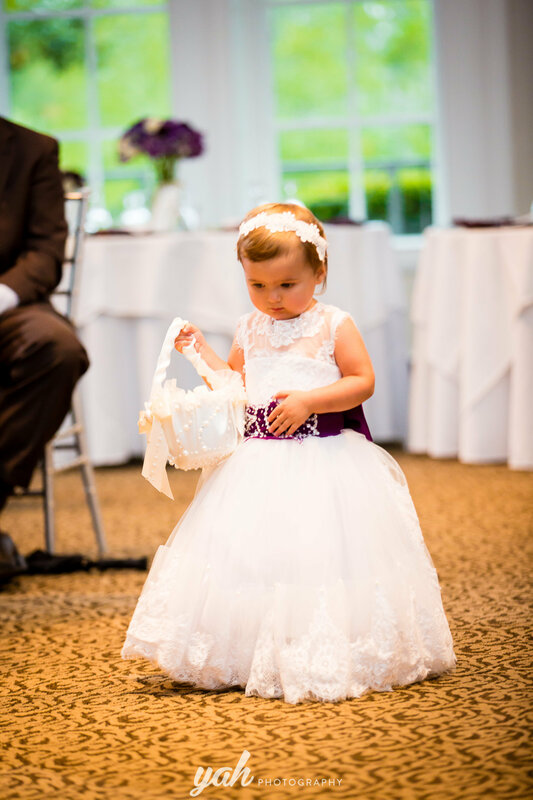 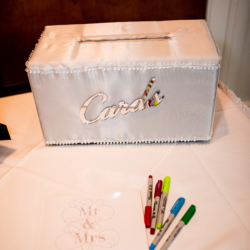 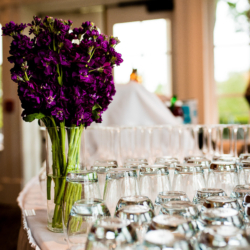 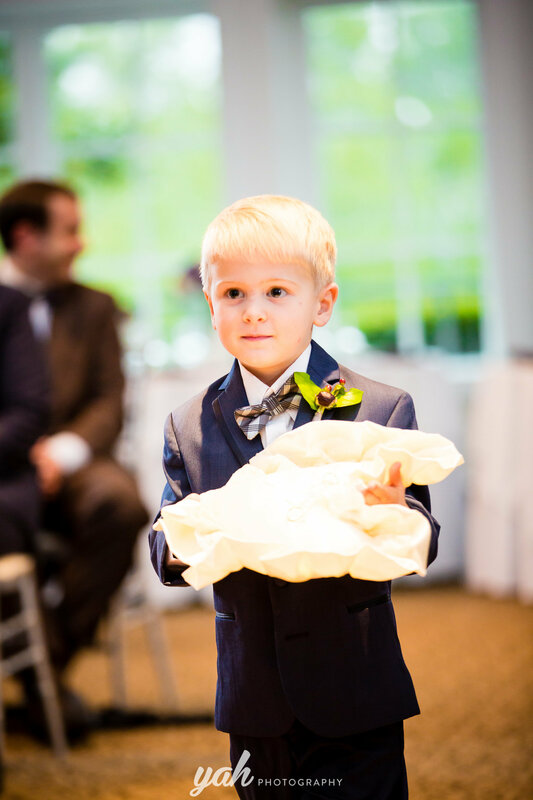 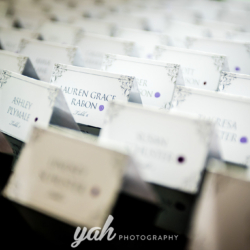 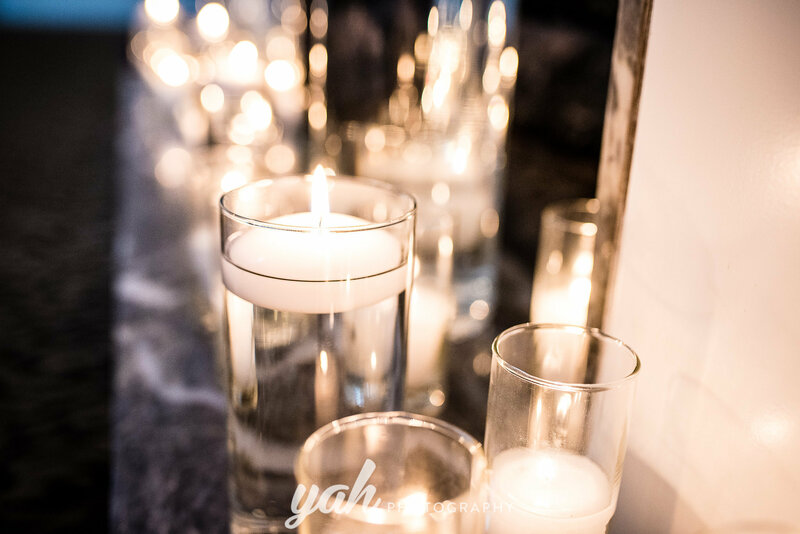 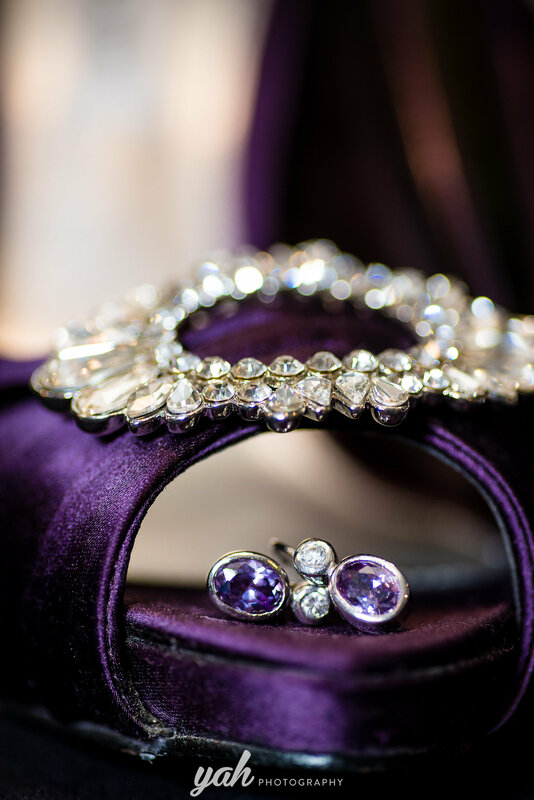 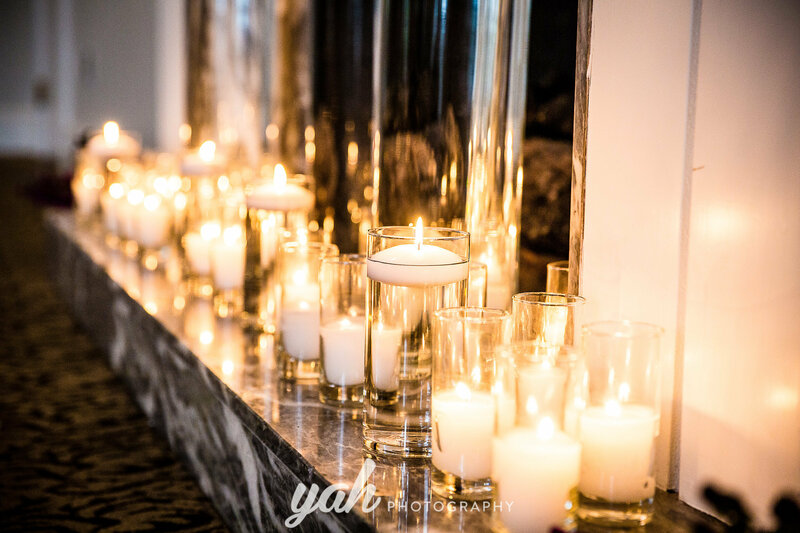 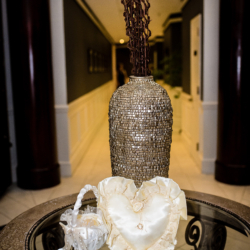 Every color and item on the guest tables went together cohesively to make her wedding truly an elegant affair. 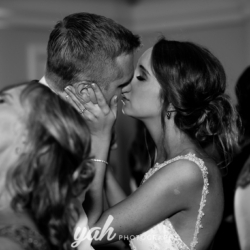 Bri and Ryan are an amazing couple who are so in love. 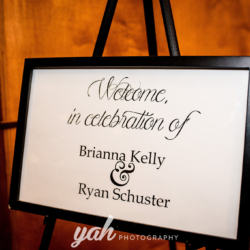 Bri is THE sweetest person I have ever met. 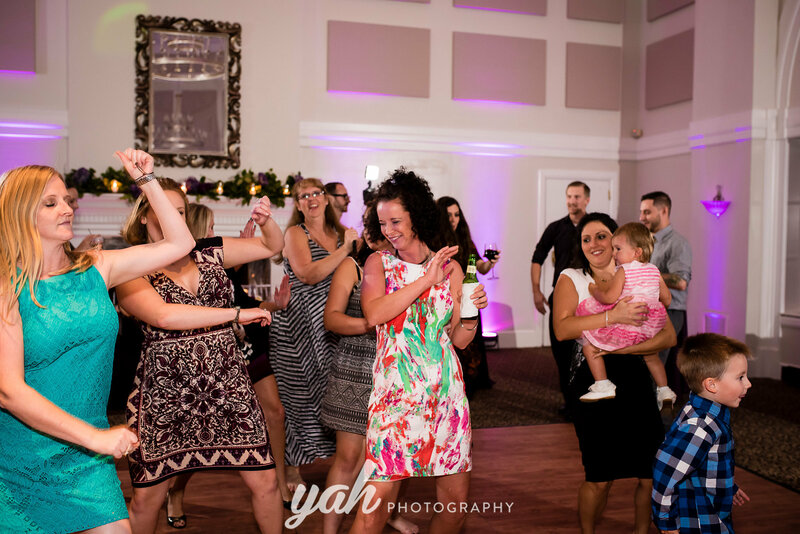 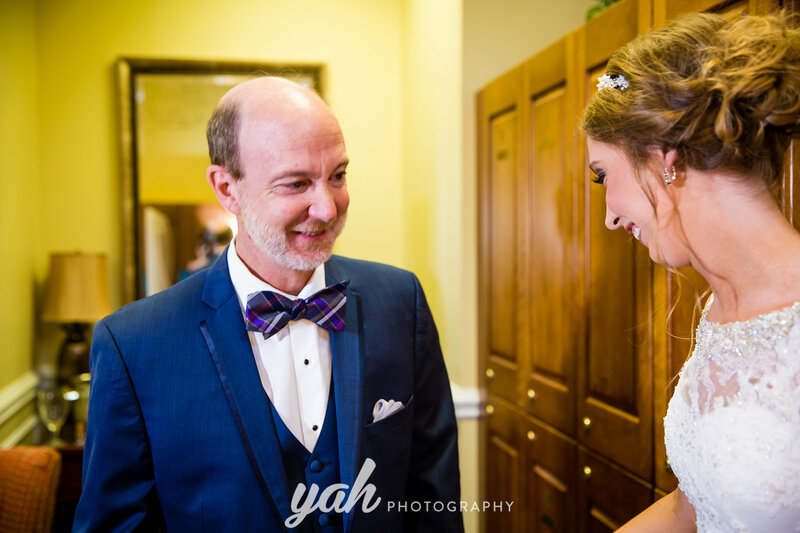 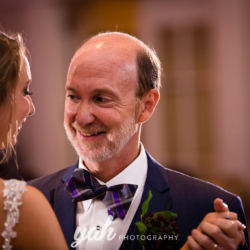 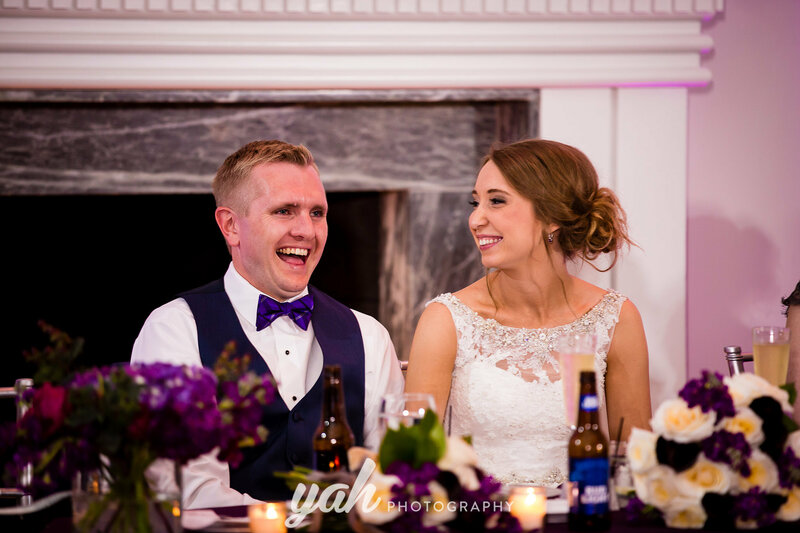 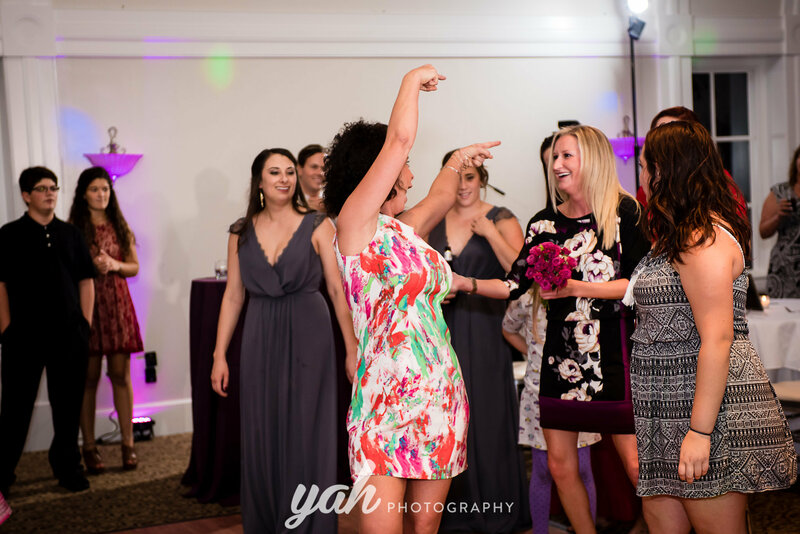 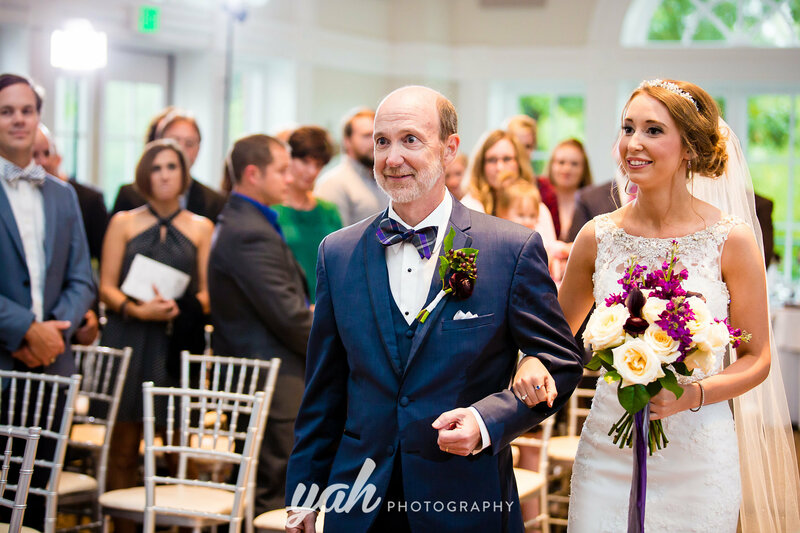 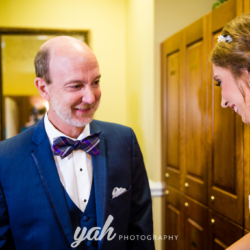 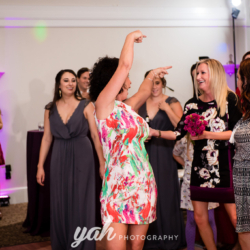 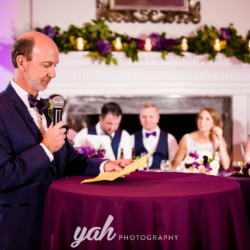 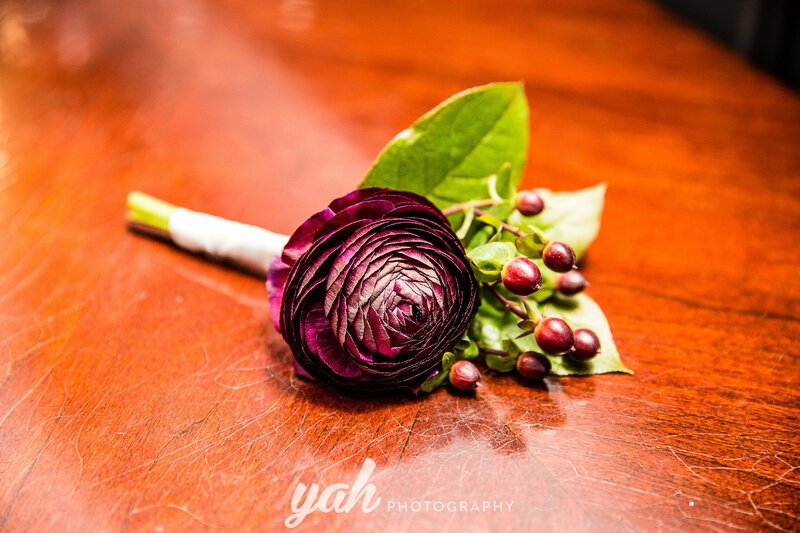 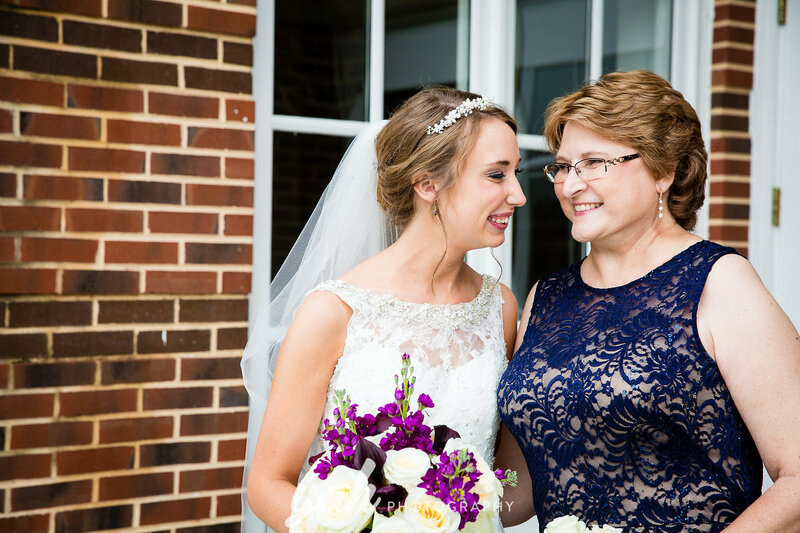 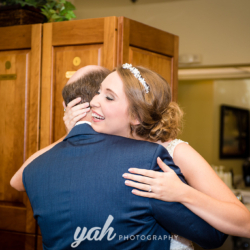 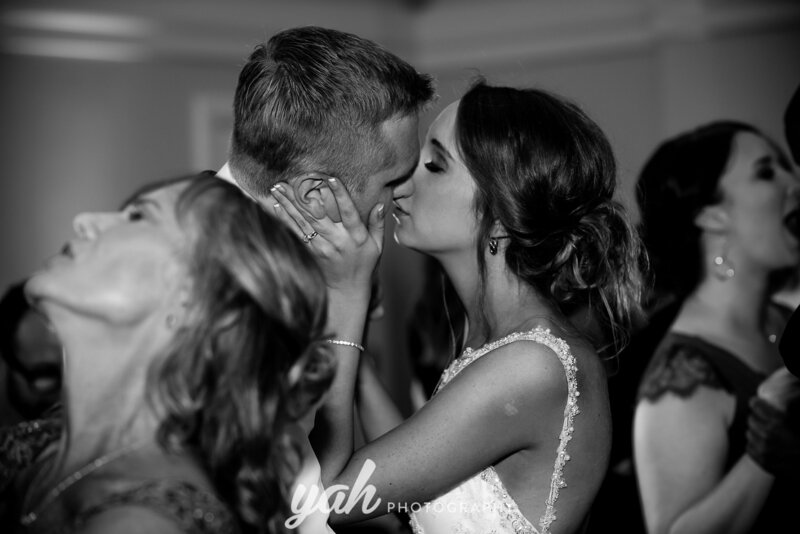 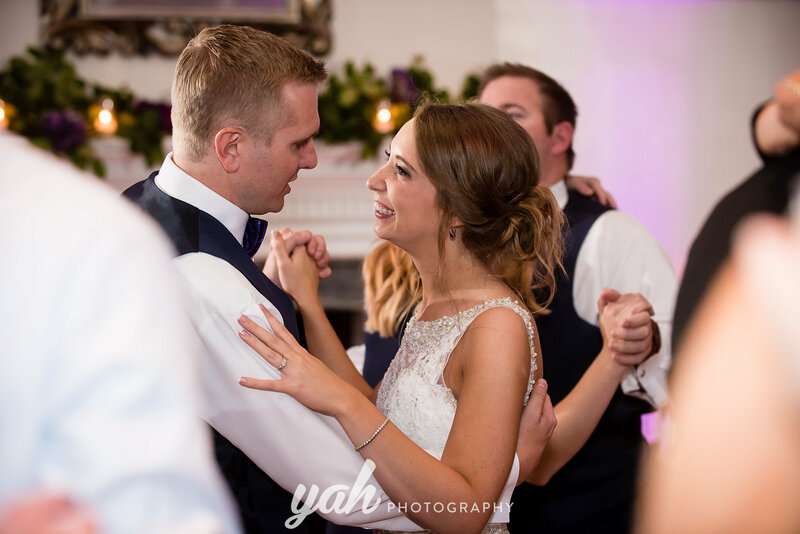 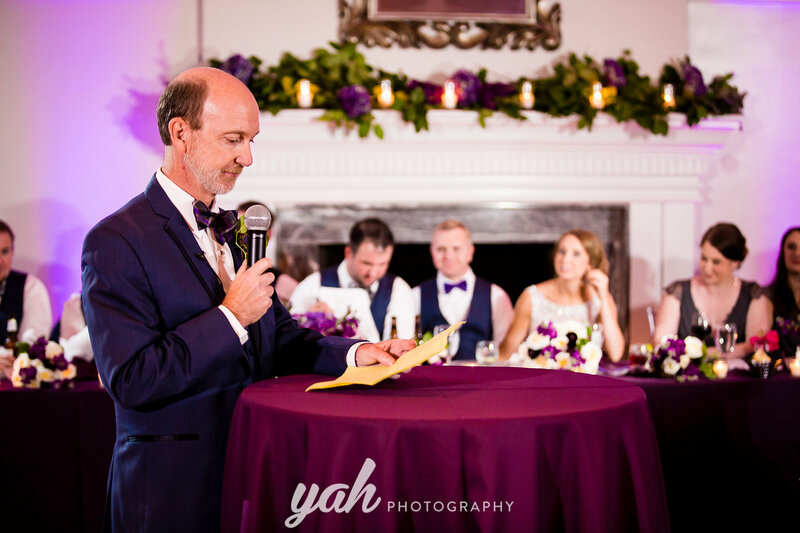 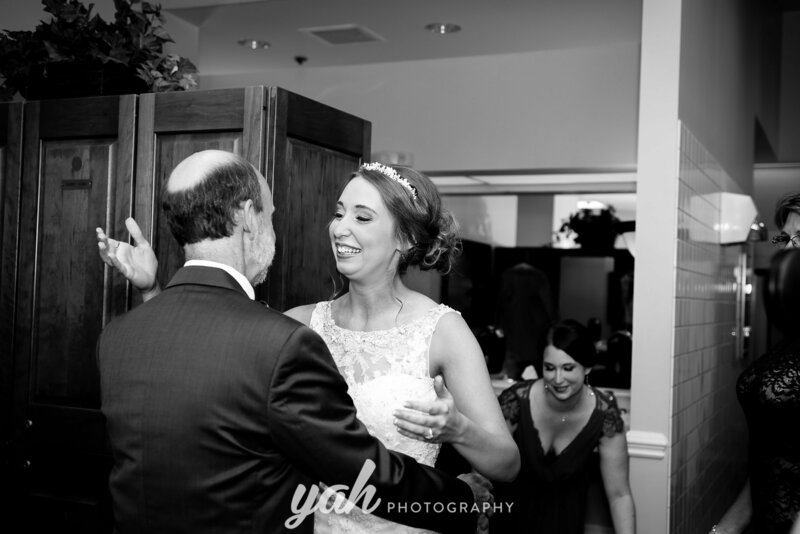 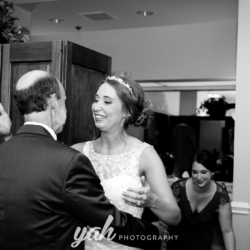 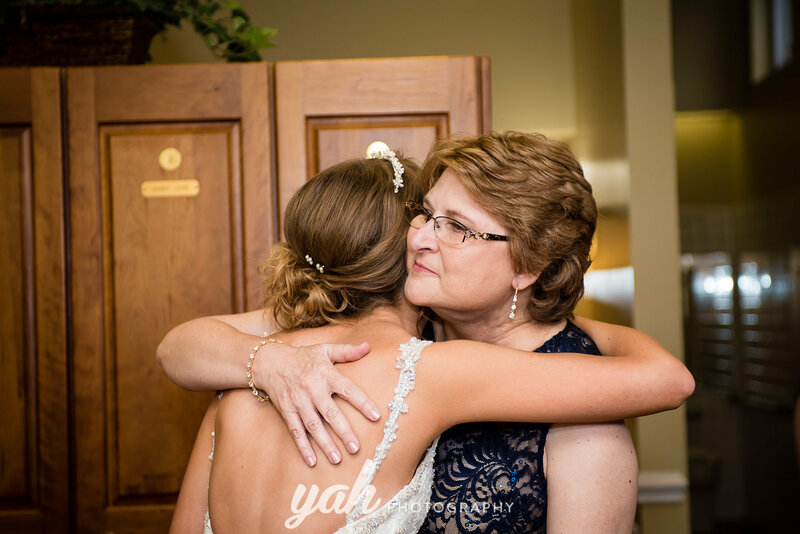 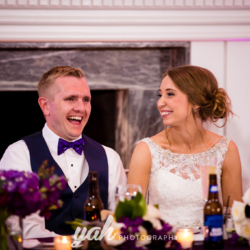 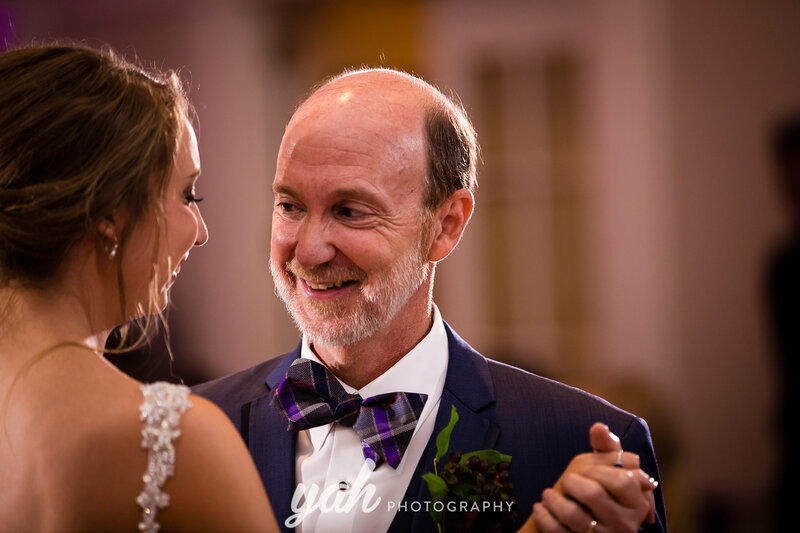 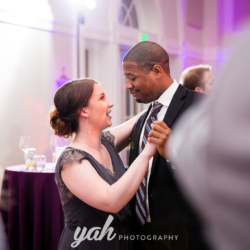 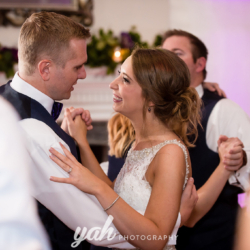 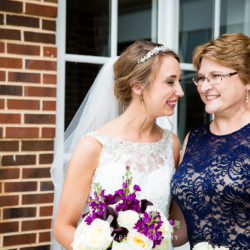 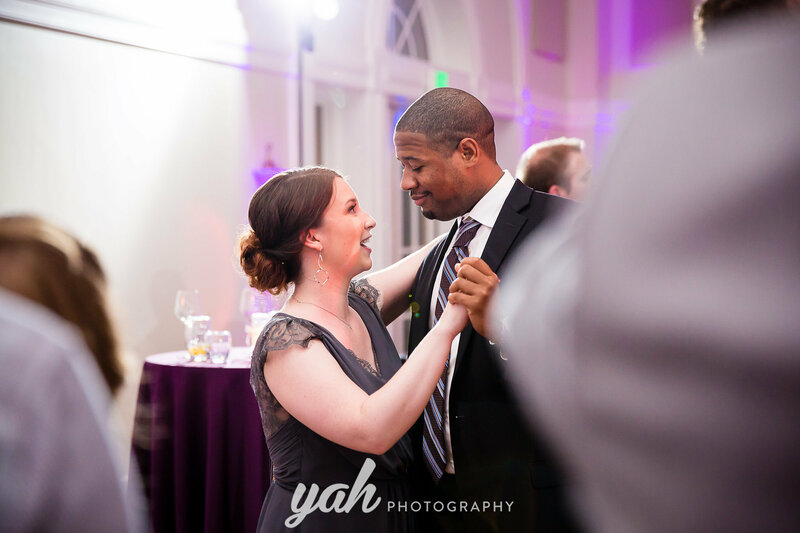 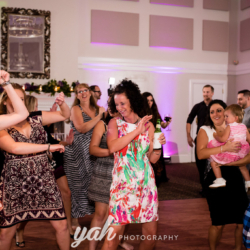 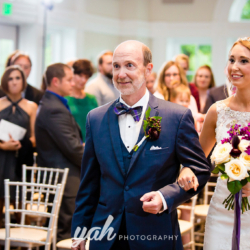 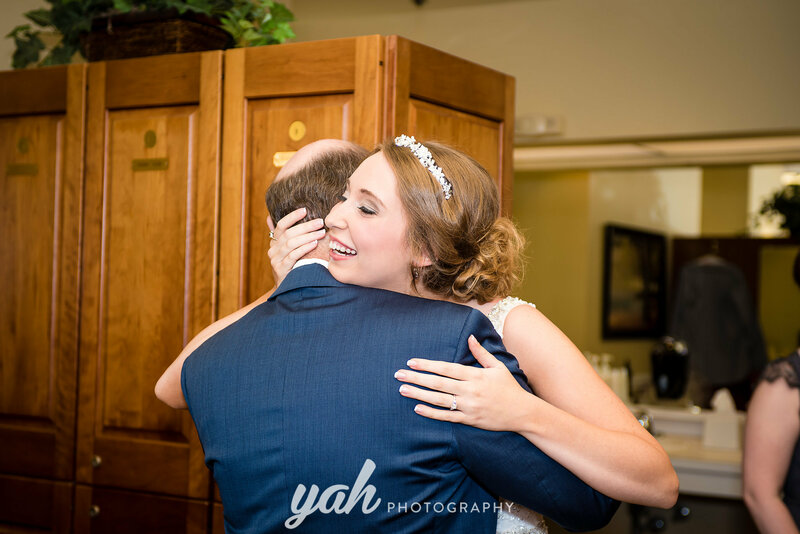 She was so upbeat and positive throughout the planning process and throughout the wedding day (except don’t ask her to dance to a line dance!). 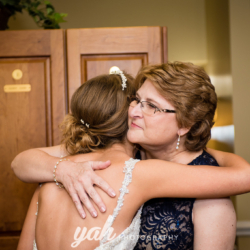 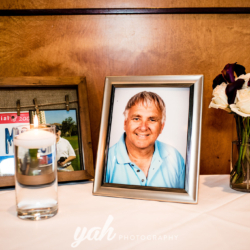 Her family was so nice throughout the day and you can really tell they all have a shared love for one another. 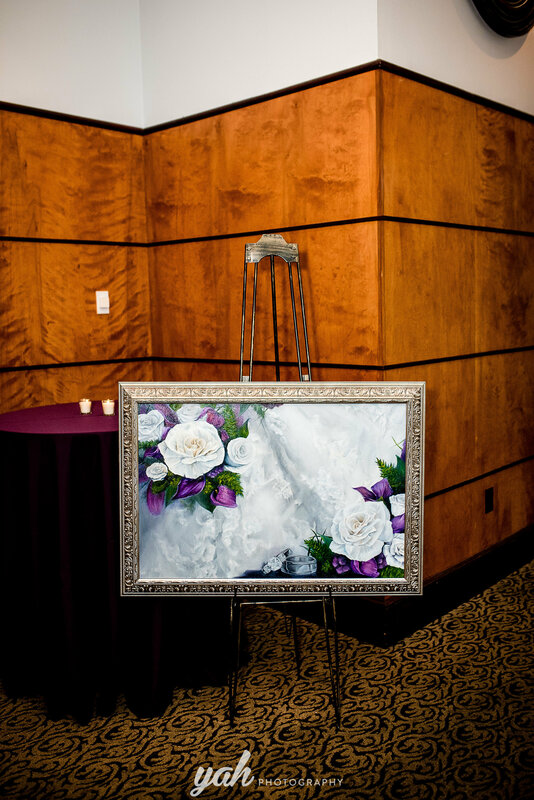 Ryan had one of Bri’s bridesmaids, who is an amazingly talented artist, paint her bouquet as a surprise for her on her wedding day! 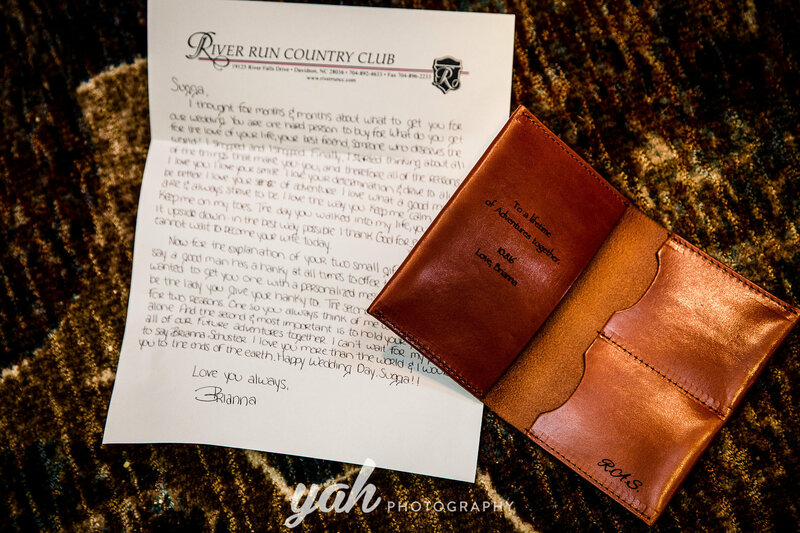 She was truly touched by this gift. 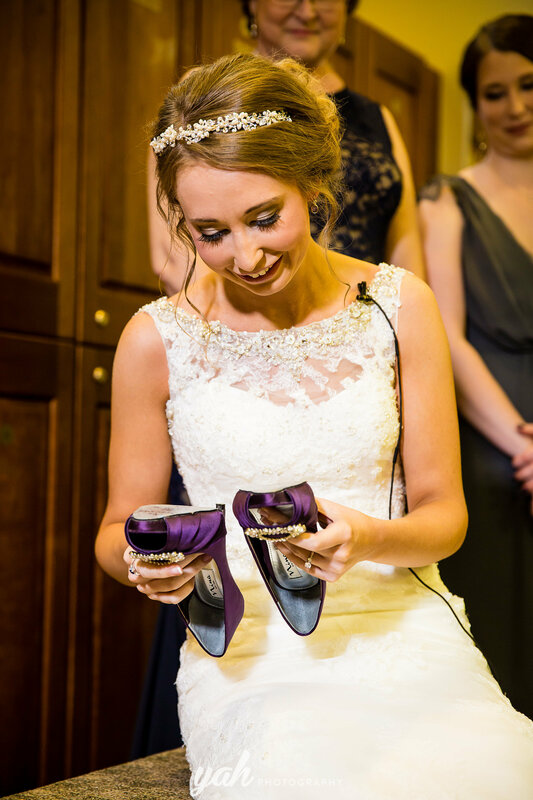 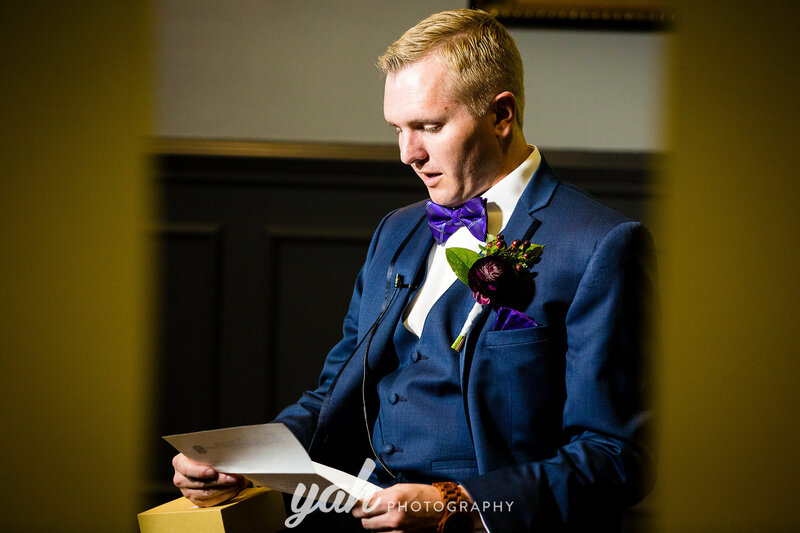 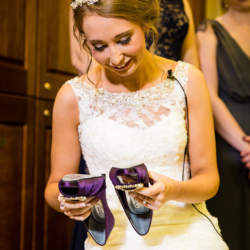 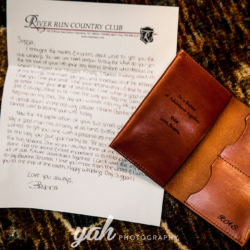 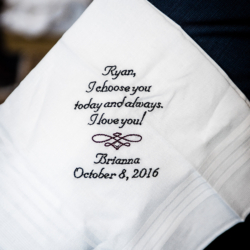 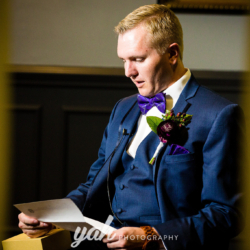 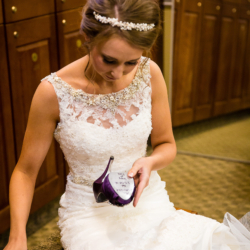 He also wrote a message on her shoes and she was so surprised when she saw it  Ryan and I had been scheming these sweet surprises for his bride. 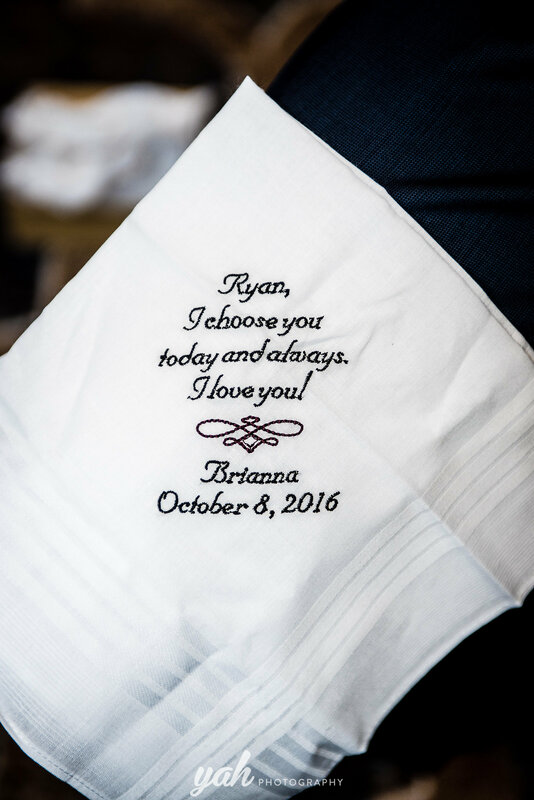 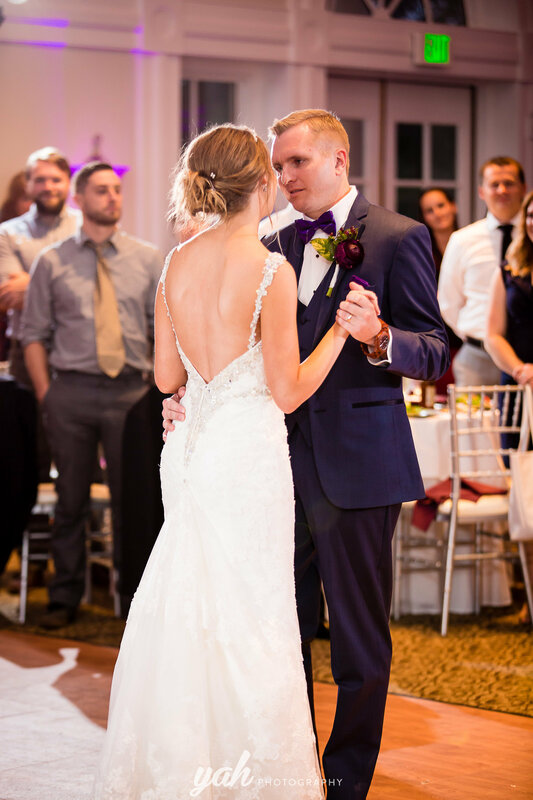 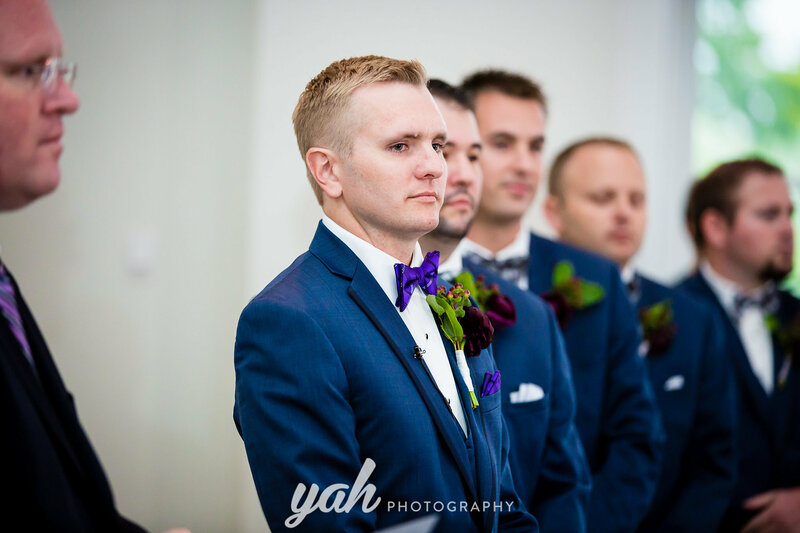 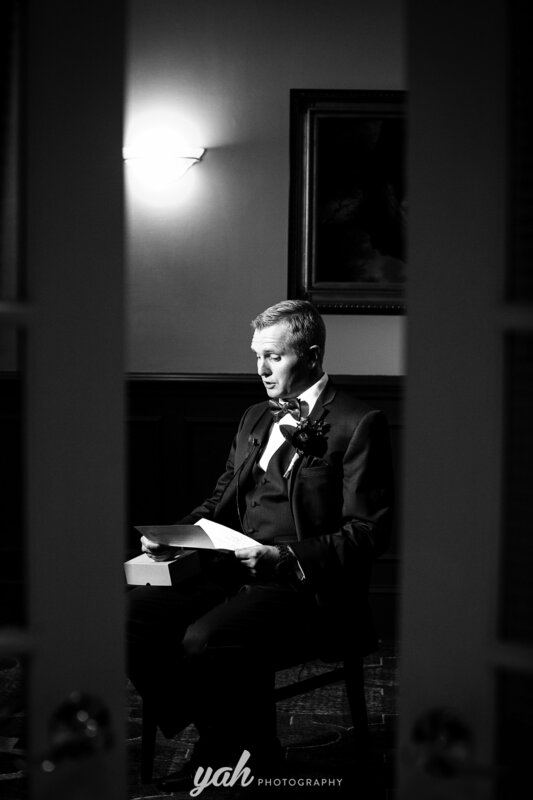 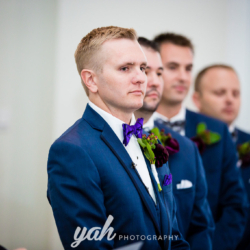 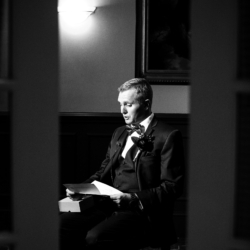 Beyond all of the nice things I have to say about Bri and Ryan and their family, Bri trusted me completely with her design from the linens, to the flowers, to the paper products selected and I am so thankful she did and we could make her wedding completely a reflection of what they wanted. 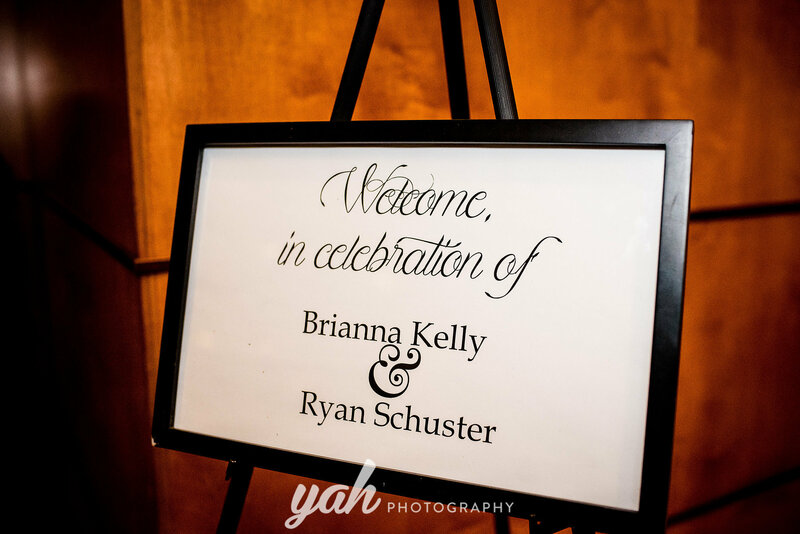 Bri and Ryan I wish you all the happiness in the world!